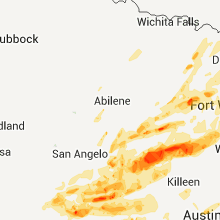 The Merkel, TX area has had 14 reports of on-the-ground hail by trained spotters, and has been under severe weather warnings 27 times during the past 12 months. Doppler radar has detected hail at or near Merkel, TX on 61 occasions, including 4 occasions during the past year. 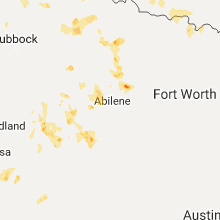 4/23/2019 6:45 PM CDT At 645 pm cdt, a severe thunderstorm was located over trent, or 17 miles east of sweetwater, moving northeast at 25 mph (radar indicated). Hazards include 60 mph wind gusts and quarter size hail. Hail damage to vehicles is expected. expect wind damage to roofs, siding, and trees. Locations impacted include, merkel, hawley, trent, noodle, hodges, stith and truby. 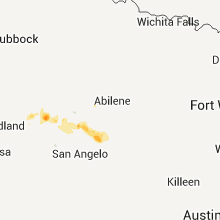 4/23/2019 6:29 PM CDT At 628 pm cdt, a severe thunderstorm was located near trent, or 12 miles east of sweetwater, moving northeast at 25 mph (radar indicated). Hazards include 60 mph wind gusts and quarter size hail. Hail damage to vehicles is expected. Expect wind damage to roofs, siding, and trees. 4/23/2019 4:42 PM CDT At 442 pm cdt, a severe thunderstorm was located 7 miles east of nolan, or 18 miles northeast of blackwell, moving east at 25 mph. this storm has a history of producing golf ball size hail. this is a very dangerous storm (radar indicated). Hazards include baseball size hail and 60 mph wind gusts. People and animals outdoors will be severely injured. expect shattered windows, extensive damage to roofs, siding, and vehicles. this severe thunderstorm will be near, coronados camp around 455 pm cdt. view around 515 pm cdt. 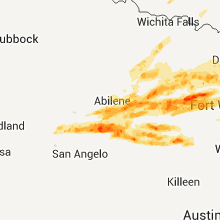 buffalo gap, caps and dyess afb around 520 pm cdt. tye around 525 pm cdt. wylie around 530 pm cdt. hamby and potosi around 545 pm cdt. other locations impacted by this severe thunderstorm include impact, lake abilene, camp tonkawa, shep, lake fort phantom hill, camp butman and kirby lake. This includes interstate 20 between mile markers 269 and 292. 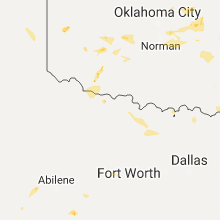 4/23/2019 12:33 PM CDT At 1233 pm cdt, a severe thunderstorm was located over noodle, or 12 miles southwest of anson, moving east at 35 mph (radar indicated). Hazards include 60 mph wind gusts and quarter size hail. Hail damage to vehicles is expected. expect wind damage to roofs, siding, and trees. This severe thunderstorm will remain over mainly rural areas of southwestern jones and northwestern taylor counties, including the following locations, the intersection of us- 180 and ranch road 126 and stith. 4/23/2019 12:26 PM CDT A severe thunderstorm warning remains in effect until 1245 pm cdt for southwestern jones. southeastern fisher and northwestern taylor counties. at 1226 pm cdt, a severe thunderstorm was located over noodle, or 16 miles southwest of anson, moving east at 35 mph. hazard. 60 mph wind gusts and quarter size hail. 4/23/2019 12:09 PM CDT A severe thunderstorm warning remains in effect until 1245 pm cdt for southwestern jones. northeastern nolan. southeastern fisher and northwestern taylor counties. at 1208 pm cdt, a severe thunderstorm was located 8 miles west of trent, or 9 miles northeast of sweetwater, moving east at 35 mph. hazard. 60 mph wind gusts and quarter size hail. 4/23/2019 12:00 PM CDT The national weather service in san angelo has issued a * severe thunderstorm warning for. southwestern jones county in west central texas. northeastern nolan county in west central texas. southeastern fisher county in west central texas. Northwestern taylor county in west central texas. 3/13/2019 1:21 AM CDT At 120 am cdt, severe thunderstorms were located along a line extending from 8 miles south of sagerton to near tye to near hylton, moving east at 65 mph (radar indicated). Hazards include 70 mph wind gusts. Expect considerable tree damage. damage is likely to mobile homes, roofs, and outbuildings. 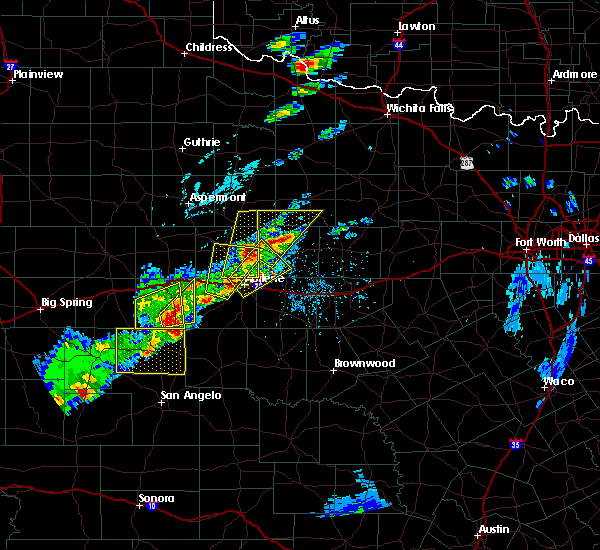 these severe storms will be near, tye and hawley around 125 am cdt. 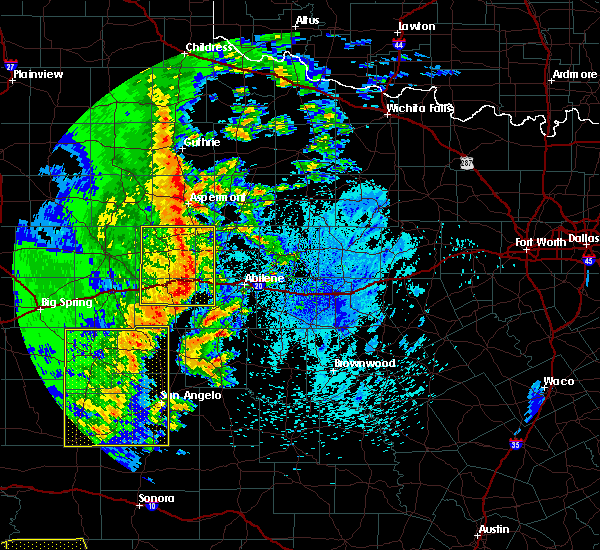 abilene around 130 am cdt. 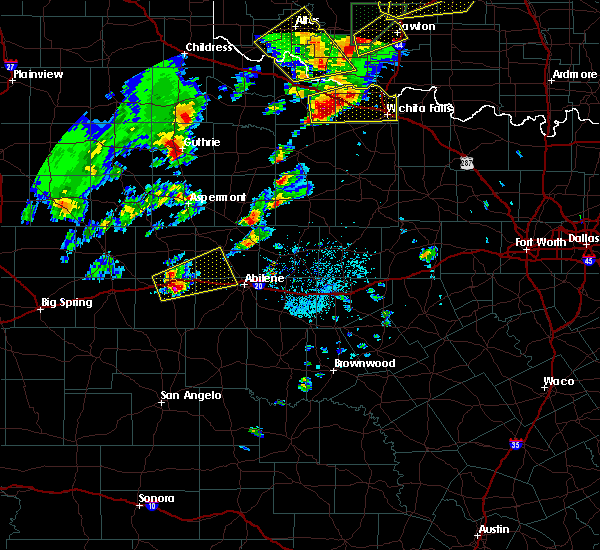 hamby and avoca around 135 am cdt. stamford and bradshaw around 140 am cdt. lawn around 145 am cdt. 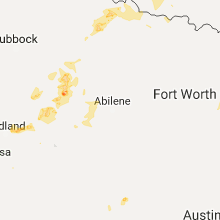 other locations impacted by these severe thunderstorms include funston, impact, the intersection of us- 180 and ranch road 126, lake abilene, camp tonkawa, tuxedo, shep, lake fort phantom hill, lake sweetwater and the intersection of us- 180 and farm road 600. A tornado watch remains in effect until 500 am cdt for west central texas. 3/13/2019 1:08 AM CDT At 107 am cdt, severe thunderstorms were located along a line extending from 6 miles northeast of hamlin to near merkel to blackwell, moving east at 55 mph (radar indicated). Hazards include 70 mph wind gusts. Expect considerable tree damage. damage is likely to mobile homes, roofs, and outbuildings. 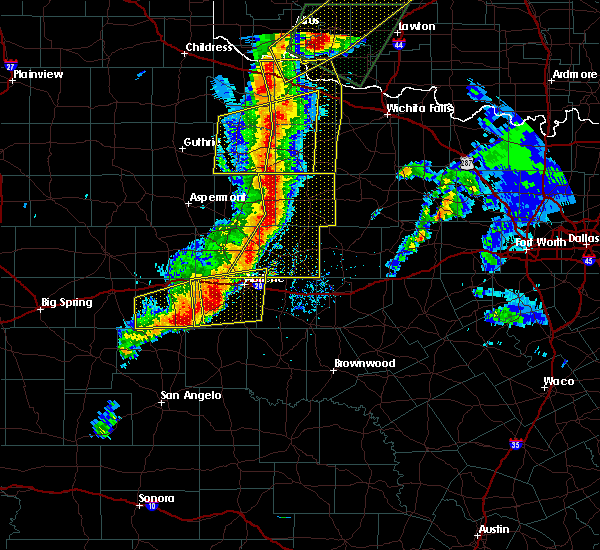 these severe storms will be near, tye around 110 am cdt. hawley around 115 am cdt. 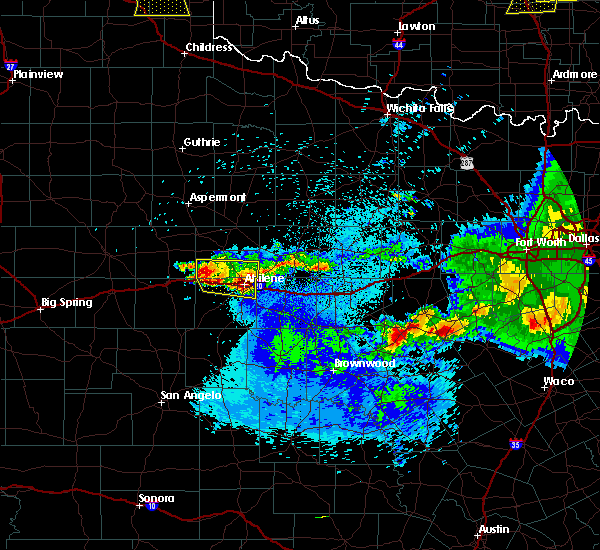 abilene and happy valley around 125 am cdt. hamby and avoca around 125 am cdt. stamford and bradshaw around 130 am cdt. lawn around 135 am cdt. other locations impacted by these severe thunderstorms include funston, impact, the intersection of us- 180 and ranch road 126, lake abilene, camp tonkawa, hitson, tuxedo, shep, lake fort phantom hill and lake sweetwater. A tornado watch remains in effect until 500 am cdt for west central texas. 3/13/2019 12:55 AM CDT At 1254 am cdt, severe thunderstorms were located along a line extending from 10 miles west of hamlin to near trent to 6 miles northwest of blackwell, moving east at 50 mph (radar indicated). Hazards include 60 mph wind gusts. Expect damage to roofs, siding, and trees. 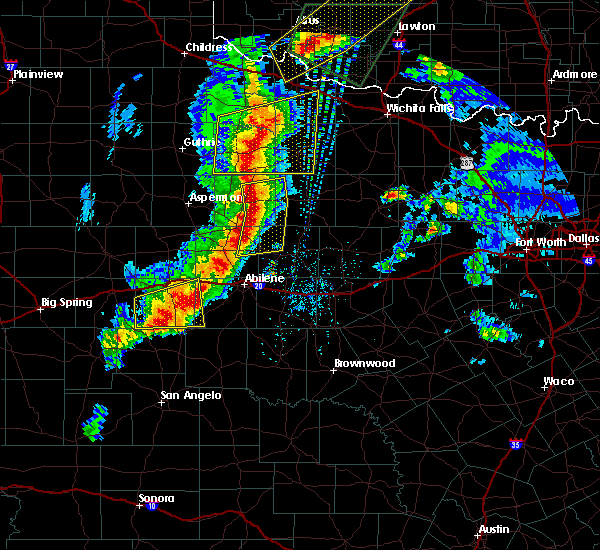 severe thunderstorms will be near, trent and noodle around 100 am cdt. merkel around 105 am cdt. 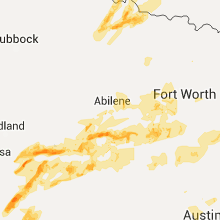 tye, happy valley and dyess afb around 115 am cdt. 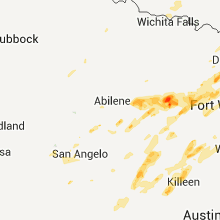 wylie around 115 am cdt. bradshaw around 120 am cdt. 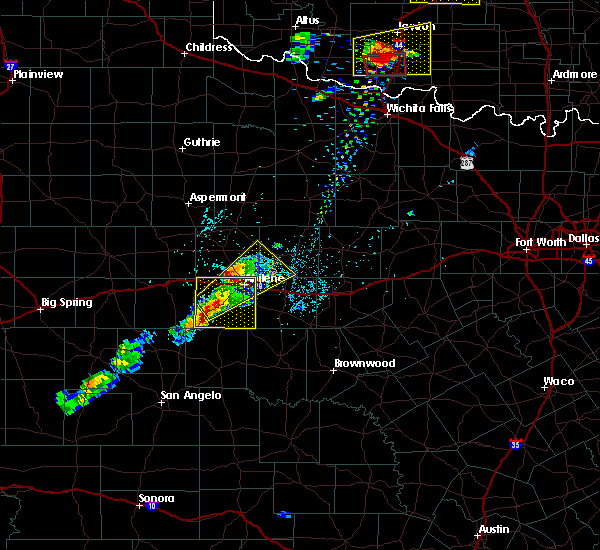 avoca, hamby and potosi around 125 am cdt. lawn around 130 am cdt. other locations impacted by these severe thunderstorms include funston, impact, the intersection of us- 180 and ranch road 126, lake abilene, camp tonkawa, hitson, tuxedo, shep, lake fort phantom hill and lake sweetwater. this includes interstate 20 between mile markers 251 and 293. A tornado watch remains in effect until 500 am cdt for west central texas. 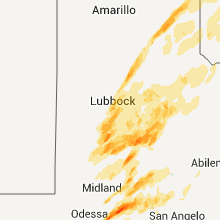 3/13/2019 12:45 AM CDT At 1244 am cdt, severe thunderstorms were located along a line extending from near rotan to near longworth to near champion, moving east at 45 mph (radar indicated). Hazards include 70 mph wind gusts. Expect considerable tree damage. damage is likely to mobile homes, roofs, and outbuildings. these severe storms will be near, longworth around 1250 am cdt. merkel, trent and noodle around 100 am cdt. other locations impacted by these severe thunderstorms include the intersection of us- 180 and ranch road 126, hitson, camp butman, gannon, the intersection of highway 70 and ranch road 53, lake sweetwater, the intersection of ranch road 608 and highway 147, camp boothe oaks, busby and capitola. A tornado watch remains in effect until 500 am cdt for west central texas. 3/13/2019 12:31 AM CDT At 1230 am cdt, severe thunderstorms were located along a line extending from near jayton to near roscoe, moving east at 45 mph (radar indicated). Hazards include 60 mph wind gusts and penny size hail. Expect damage to roofs, siding, and trees. 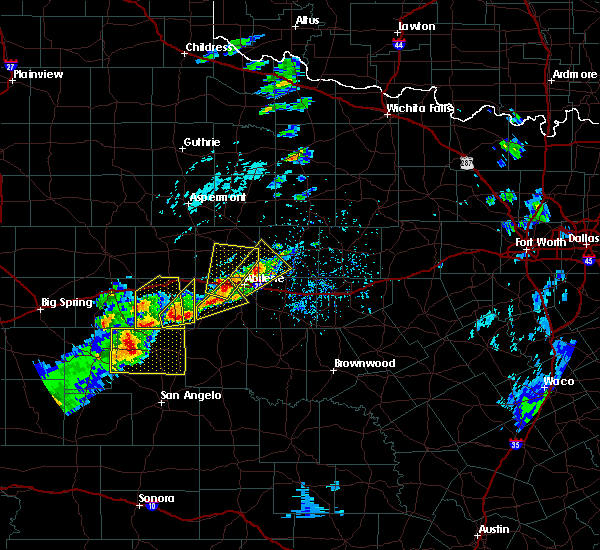 these severe storms will be near, sweetwater around 1245 am cdt. merkel, trent and noodle around 100 am cdt. other locations impacted by these severe thunderstorms include the intersection of us-180 and ranch road 126, us-84 near the nolan- fisher county line, i-20 near the nolan- mitchell county line, hitson, camp butman, gannon, the intersection of highway 70 and ranch road 53, lake sweetwater, the intersection of ranch road 608 and highway 147 and camp boothe oaks. A tornado watch remains in effect until 500 am cdt for west central texas. 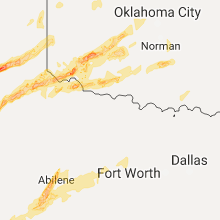 3/13/2019 12:15 AM CDT At 1214 am cdt, severe thunderstorms were located along a line extending from near clairemont to near colorado city, moving east at 55 mph (radar indicated). Hazards include 60 mph wind gusts and penny size hail. Expect damage to roofs, siding, and trees. 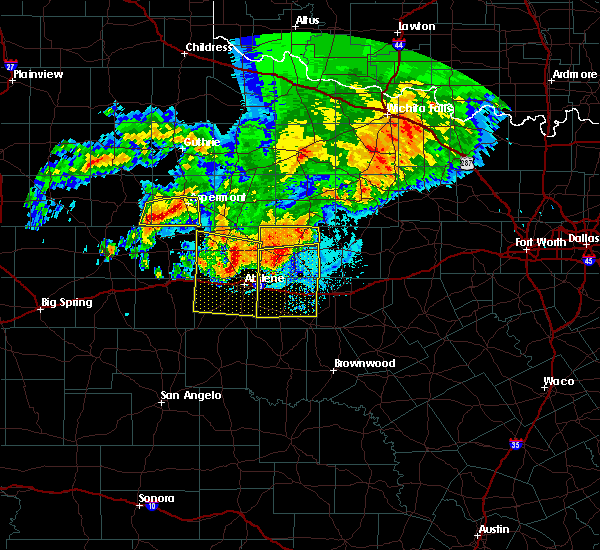 severe thunderstorms will be near, wastella and champion around 1225 am cdt. roscoe around 1235 am cdt. sweetwater around 1245 am cdt. merkel, trent and noodle around 100 am cdt. other locations impacted by these severe thunderstorms include the intersection of us-180 and ranch road 126, us-84 near the nolan- fisher county line, i-20 near the nolan- mitchell county line, hitson, camp butman, gannon, the intersection of highway 70 and ranch road 53, lake sweetwater, the intersection of ranch road 608 and highway 147 and camp boothe oaks. this includes interstate 20 between mile markers 229 and 269. A tornado watch remains in effect until 500 am cdt for west central texas. 12/26/2018 4:34 PM CST At 432 pm cst, severe thunderstorms were located along a line extending from near avoca to 6 miles west of novice, moving east at 35 mph. 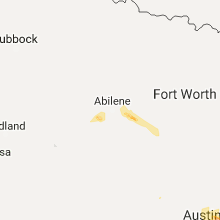 expect wind gusts of 60 to 65 mph in abilene (radar indicated). Hazards include 60 mph wind gusts. Expect damage to roofs, siding, and trees. these severe storms will be near, stamford around 445 pm cst. oplin around 450 pm cst. 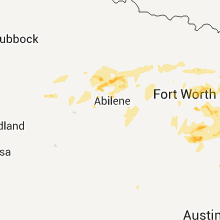 other locations impacted by these severe thunderstorms include funston, impact, the intersection of us- 180 and ranch road 126, lake abilene, camp tonkawa, tuxedo, shep, lake fort phantom hill, the intersection of us- 180 and farm road 600 and ovalo. 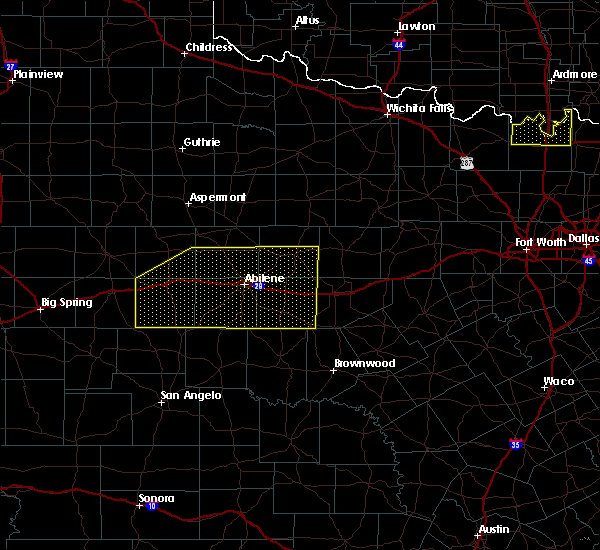 A tornado watch remains in effect until 1000 pm cst for west central texas. 12/26/2018 4:20 PM CST At 419 pm cst, severe thunderstorms were located along a line extending from near stamford to 6 miles southeast of bradshaw, moving east at 35 mph (radar indicated). Hazards include 60 mph wind gusts. Expect damage to roofs, siding, and trees. 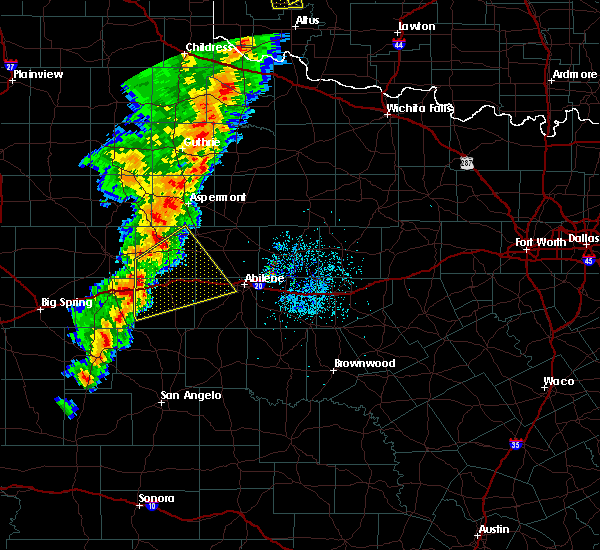 severe thunderstorms will be near, avoca around 435 pm cst. 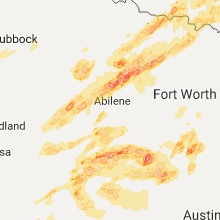 stamford around 445 pm cst abilene around 440 pm cst other locations impacted by these severe thunderstorms include funston, impact, the intersection of us- 180 and ranch road 126, lake abilene, camp tonkawa, tuxedo, shep, lake fort phantom hill, the intersection of us- 180 and farm road 600 and ovalo. this includes interstate 20 between mile markers 261 and 302. 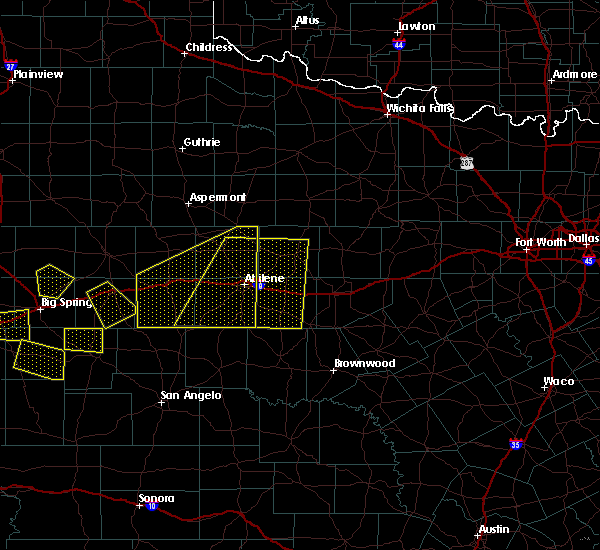 A tornado watch remains in effect until 1000 pm cst for west central texas. 7/30/2018 7:12 AM CDT The severe thunderstorm warning for callahan, southern jones, nolan, southern shackelford, southeastern fisher and taylor counties will expire at 715 am cdt, the storms which prompted the warning have weakened below severe limits, and no longer pose an immediate threat to life or property. therefore, the warning will be allowed to expire. however gusty winds are still possible with these thunderstorms. 7/30/2018 6:52 AM CDT At 650 am cdt, a severe thunderstorm was located 8 miles southwest of merkel, or 20 miles east of sweetwater, moving south at 20 mph (radar indicated). Hazards include 60 mph wind gusts. Expect damage to roofs, siding, and trees. this severe storm will be near, coronados camp around 705 am cdt. happy valley around 715 am cdt. Other locations impacted by this severe thunderstorm include funston, shep, lake sweetwater, the intersection of us- 180 and farm road 600, admiral, camp butman, the intersection of ranch road 608 and highway 147, camp boothe oaks, impact and the intersection of us-180 and ranch road 126. 7/30/2018 6:27 AM CDT At 622 am cdt, a severe thunderstorm was located 8 miles northwest of trent, or 12 miles northeast of sweetwater, moving south at 20 mph (radar indicated). Hazards include 60 mph wind gusts. Expect damage to roofs, siding, and trees. this severe thunderstorm will be near, abilene around 630 am cdt. trent around 630 am cdt. nolan around 645 am cdt. coronados camp around 650 am cdt. happy valley around 700 am cdt. bradshaw around 705 am cdt. This includes interstate 20 between mile markers 229 and 323. 6/7/2018 10:41 PM CDT At 1040 pm cdt, a severe thunderstorm was located over lawn, or 17 miles northeast of winters, moving south at 25 mph. although storms across the warned area have weakened, wind gusts to near 60 mph or hail up to quarter size are still possible in the stronger storms (radar indicated). Hazards include 60 mph wind gusts and quarter size hail. Hail damage to vehicles is expected. expect wind damage to roofs, siding, and trees. 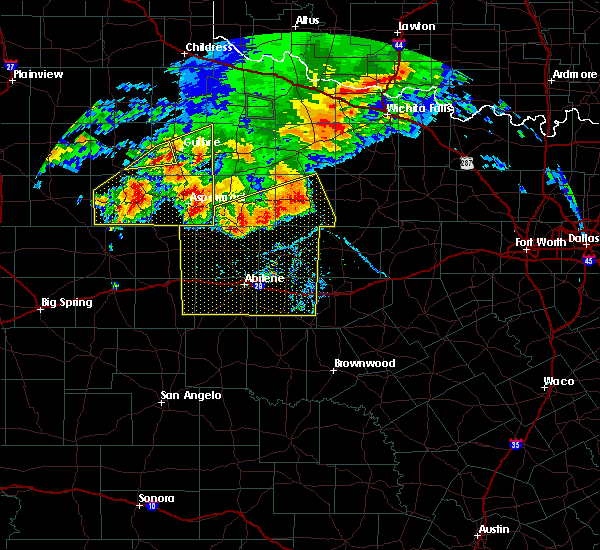 this severe storm will be near, novice and crews around 1100 pm cdt. Other locations impacted by this severe thunderstorm include impact, lake abilene, camp tonkawa, shep, wilmeth, lake fort phantom hill, ovalo, hodges, drasco and pumphrey. 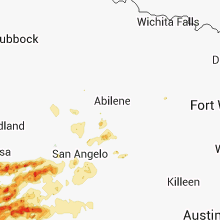 6/7/2018 9:59 PM CDT The national weather service in san angelo has issued a * severe thunderstorm warning for. northeastern coke county in west central texas. western callahan county in west central texas. southern jones county in west central texas. Northwestern coleman county in west central texas. 6/7/2018 9:49 PM CDT At 948 pm cdt, a severe thunderstorm was located over dyess afb, or 7 miles west of abilene, moving south at 25 mph. 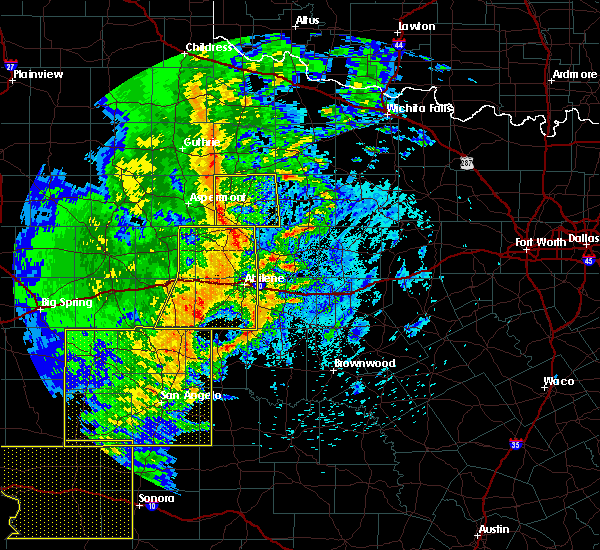 the dyess asos reported a wind gust to 82 mph at 9:39 mph. this is a very dangerous storm (radar indicated). Hazards include 80 mph wind gusts and ping pong ball size hail. Flying debris will be dangerous to those caught without shelter. mobile homes will be heavily damaged. expect considerable damage to roofs, windows, and vehicles. extensive tree damage and power outages are likely. this severe storm will be near, wylie around 955 pm cdt. 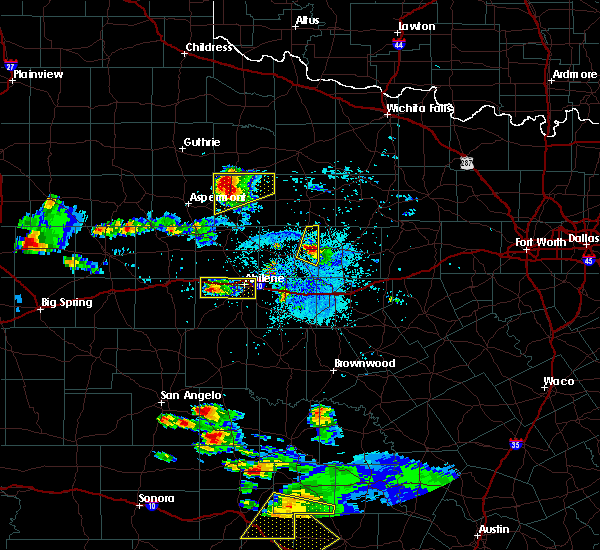 buffalo gap and view around 1000 pm cdt. Other locations impacted by this severe thunderstorm include funston, impact, hodges, the intersection of us- 180 and ranch road 126, lake abilene, camp tonkawa, lake fort phantom hill, camp butman, kirby lake and stith. 6/7/2018 9:31 PM CDT A severe thunderstorm warning remains in effect until 1000 pm cdt for jones. east central nolan and taylor counties. at 929 pm cdt, a severe thunderstorm was located near abilene, moving south at 30 mph. hazard. 70 mph wind gusts and ping pong ball size hail. source. Radar indicated. 6/7/2018 9:20 PM CDT At 917 pm cdt, a severe thunderstorm was located near hawley, or 7 miles northwest of abilene, moving south at 30 mph. the public reported quarter size hail and estimated 70 mph winds in hawley at 910 pm cdt. 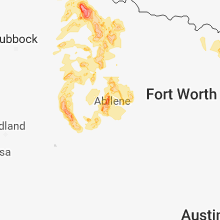 the city of abilene is also in the path of this storm, with the western portions of the city most likely to see the strongest winds and largest hail (radar indicated). Hazards include 70 mph wind gusts and quarter size hail. Hail damage to vehicles is expected. expect considerable tree damage. wind damage is also likely to mobile homes, roofs, and outbuildings. this severe storm will be near, tye around 925 pm cdt. 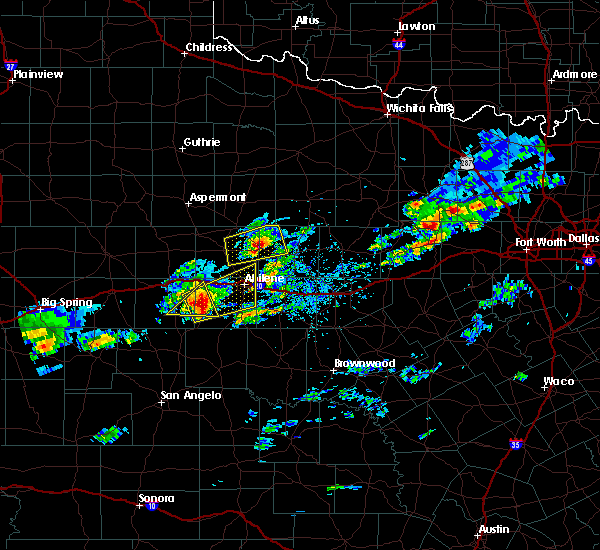 dyess afb around 930 pm cdt. 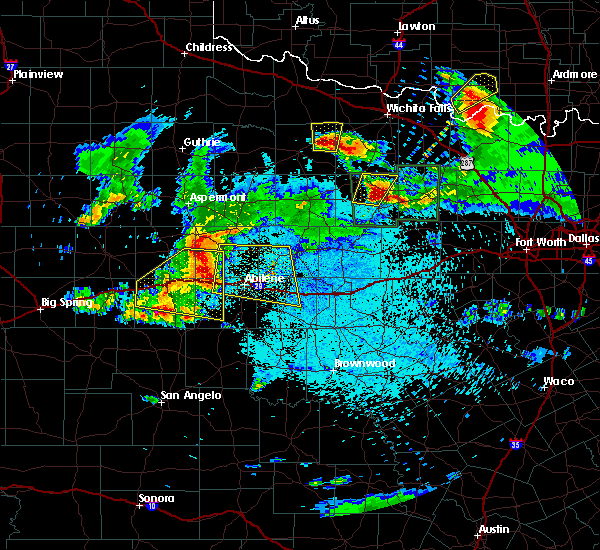 wylie, caps and view around 940 pm cdt. potosi around 945 pm cdt. buffalo gap around 950 pm cdt. tuscola around 1000 pm cdt. 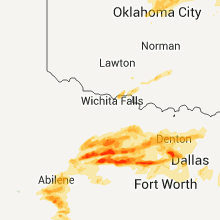 Other locations impacted by this severe thunderstorm include funston, impact, the intersection of us- 180 and ranch road 126, lake abilene, camp tonkawa, lake fort phantom hill, the intersection of us- 180 and farm road 600, hodges, big country baptist assembly and camp butman. 6/7/2018 9:07 PM CDT At 907 pm cdt, a severe thunderstorm was located over hawley, or 11 miles northwest of abilene, moving south at 30 mph (radar indicated). Hazards include 60 mph wind gusts and quarter size hail. Hail damage to vehicles is expected. expect wind damage to roofs, siding, and trees. this severe thunderstorm will be near, tye around 925 pm cdt. 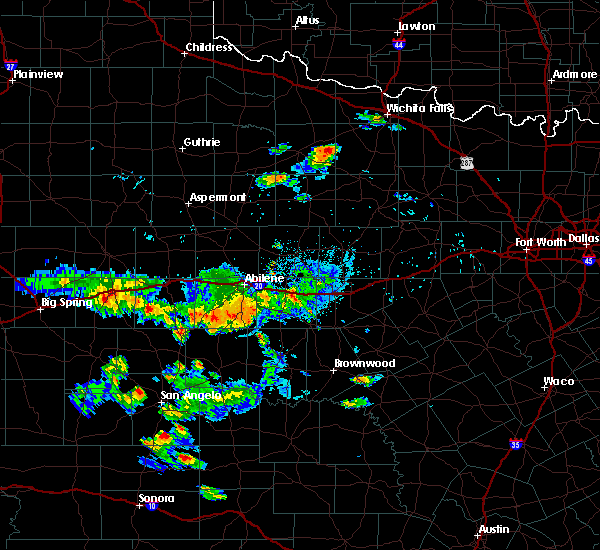 dyess afb around 930 pm cdt. 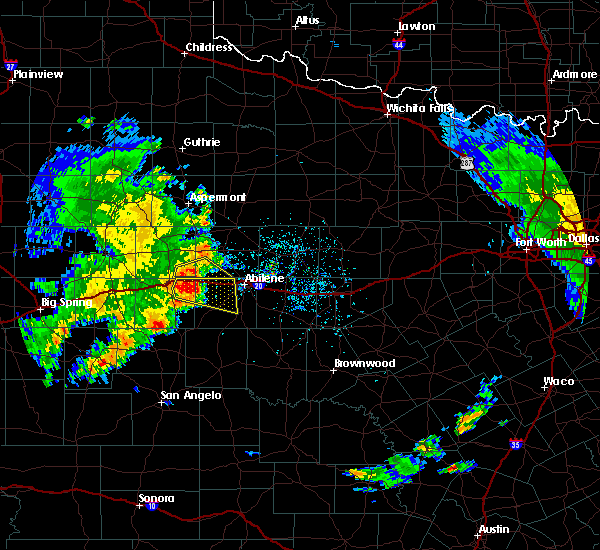 wylie and caps around 940 pm cdt. 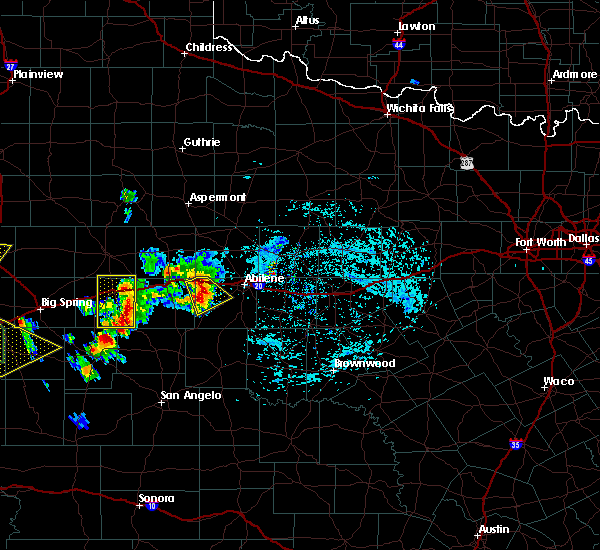 view and potosi around 945 pm cdt. buffalo gap around 950 pm cdt. tuscola around 1000 pm cdt. 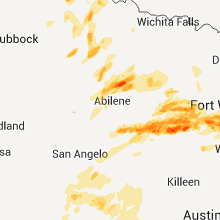 other locations impacted by this severe thunderstorm include funston, impact, the intersection of us- 180 and ranch road 126, lake abilene, camp tonkawa, lake fort phantom hill, the intersection of us- 180 and farm road 600, hodges, big country baptist assembly and camp butman. This includes interstate 20 between mile markers 261 and 293. 6/7/2018 8:21 PM CDT At 821 pm cdt, severe thunderstorms were located along a line extending from mccaulley to near albany, moving south at 35 mph. a trained spotter reported half dollar size hail in stamford at 820 pm (radar indicated). Hazards include 70 mph wind gusts and half dollar size hail. Hail damage to vehicles is expected. expect considerable tree damage. wind damage is also likely to mobile homes, roofs, and outbuildings. 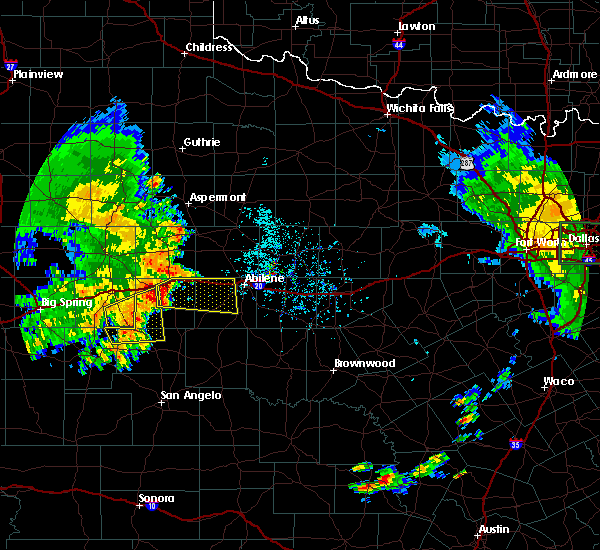 these severe storms will be near, albany around 830 pm cdt. ibex around 835 pm cdt. noodle around 845 pm cdt. moran around 850 pm cdt. trent around 855 pm cdt. merkel and putnam around 900 pm cdt. Other locations impacted by these severe thunderstorms include funston, impact, the intersection of us- 180 and ranch road 126, lake abilene, mccarty lake, camp tonkawa, hitson, lusk, tuxedo and lake fort phantom hill. 6/7/2018 8:00 PM CDT At 759 pm cdt, severe thunderstorms were located along a line extending from 7 miles northwest of hamlin to near fort griffin, moving south at 35 mph. 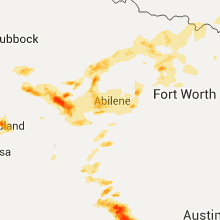 an outflow boundary ahead of the thunderstorms will move approach abilene in the next 15 to 30 minutes, with wind gusts between 60 and 70 mph possible (radar indicated). Hazards include 70 mph wind gusts and quarter size hail. Hail damage to vehicles is expected. expect considerable tree damage. wind damage is also likely to mobile homes, roofs, and outbuildings. severe thunderstorms will be near, hamlin and fort griffin around 805 pm cdt. mccaulley and neinda around 820 pm cdt. albany and sylvester around 825 pm cdt. ibex around 835 pm cdt. noodle around 845 pm cdt. moran around 850 pm cdt. trent around 855 pm cdt. putnam around 900 pm cdt. 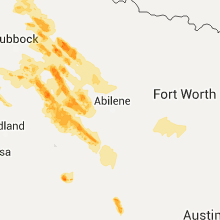 other locations impacted by these severe thunderstorms include funston, impact, the intersection of us- 180 and ranch road 126, lake abilene, mccarty lake, camp tonkawa, hitson, lusk, tuxedo and lake fort phantom hill. This includes interstate 20 between mile markers 254 and 323. 10/21/2017 7:55 PM CDT At 754 pm cdt, a severe thunderstorm was located near trent, or 18 miles east of sweetwater, moving east at 35 mph (law enforcement). Hazards include golf ball size hail and 60 mph wind gusts. People and animals outdoors will be injured. expect hail damage to roofs, siding, windows, and vehicles. expect wind damage to roofs, siding, and trees. 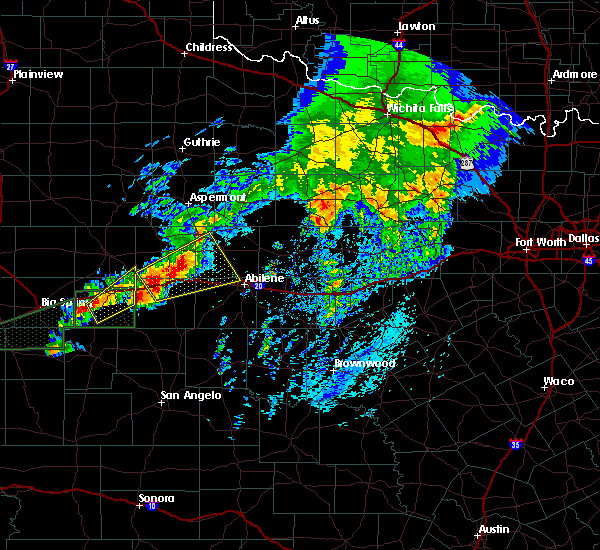 this severe storm will be near, noodle around 800 pm cdt. tye around 815 pm cdt. Other locations impacted by this severe thunderstorm include hodges, truby and stith. 10/21/2017 7:32 PM CDT At 732 pm cdt, a severe thunderstorm was located near sweetwater, moving east at 35 mph. law enforcement reported golf ball size hail in sweetwater at 625 pm (law enforcement). Hazards include golf ball size hail and 60 mph wind gusts. People and animals outdoors will be injured. expect hail damage to roofs, siding, windows, and vehicles. expect wind damage to roofs, siding, and trees. this severe storm will be near, trent around 750 pm cdt. merkel and noodle around 800 pm cdt. Other locations impacted by this severe thunderstorm include hodges, truby, stith and lake sweetwater. 10/21/2017 7:24 PM CDT At 724 pm cdt, a severe thunderstorm was located over sweetwater, moving east at 35 mph (radar indicated). Hazards include 60 mph wind gusts and quarter size hail. Hail damage to vehicles is expected. expect wind damage to roofs, siding, and trees. this severe thunderstorm will be near, trent around 750 pm cdt. merkel and noodle around 800 pm cdt. tye around 815 pm cdt. other locations impacted by this severe thunderstorm include hodges, truby, stith, lake sweetwater and camp boothe oaks. This includes interstate 20 between mile markers 239 and 281. 9/2/2017 8:15 PM CDT At 814 pm cdt, a severe thunderstorm was located near buffalo gap, or 12 miles south of abilene, moving southeast at 25 mph (radar indicated). Hazards include 60 mph wind gusts and quarter size hail. Hail damage to vehicles is expected. expect wind damage to roofs, siding, and trees. this severe storm will be near, tuscola around 820 pm cdt. dudley around 825 pm cdt. lawn around 835 pm cdt. oplin around 845 pm cdt. 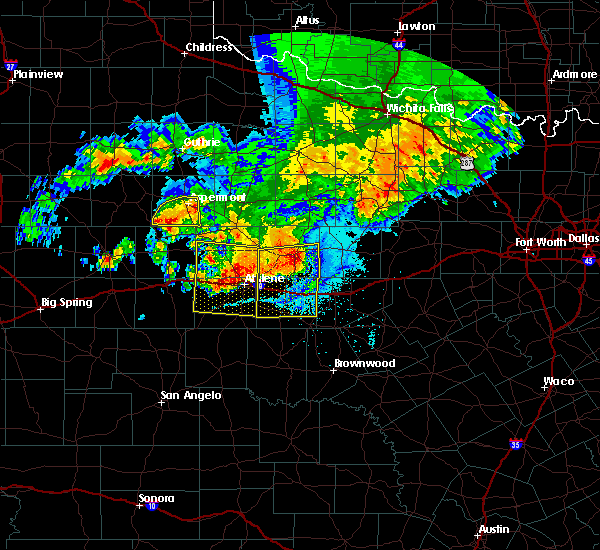 Other locations impacted by this severe thunderstorm include impact, lake abilene, camp tonkawa, kirby lake and ovalo. 9/2/2017 7:51 PM CDT At 750 pm cdt, a severe thunderstorm was located over dyess afb, or near abilene, moving southeast at 25 mph (radar indicated). Hazards include 60 mph wind gusts and quarter size hail. Hail damage to vehicles is expected. expect wind damage to roofs, siding, and trees. this severe thunderstorm will be near, view around 755 pm cdt. buffalo gap around 805 pm cdt. tuscola around 820 pm cdt. lawn around 840 pm cdt. oplin around 845 pm cdt. 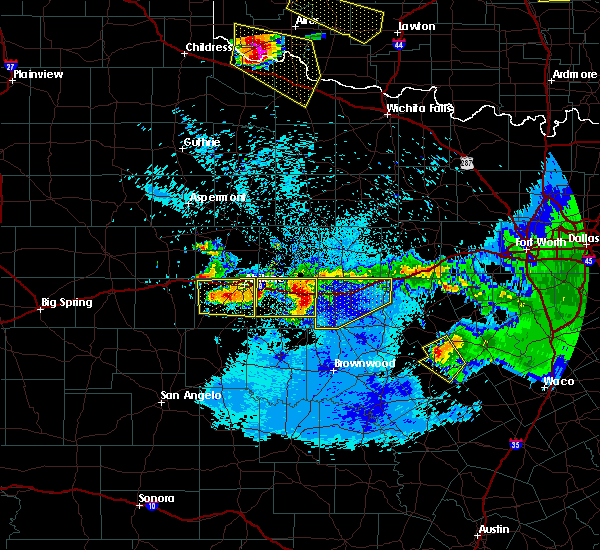 other locations impacted by this severe thunderstorm include impact, lake abilene, camp tonkawa, kirby lake and ovalo. This includes interstate 20 between mile markers 267 and 296. 8/12/2017 12:31 PM CDT At 1231 pm cdt, a severe thunderstorm was located over sweetwater, moving northeast at 40 mph (radar indicated). Hazards include 60 mph wind gusts and penny size hail. Expect damage to roofs, siding, and trees. this severe thunderstorm will be near, trent around 1255 pm cdt. noodle around 100 pm cdt. other locations impacted by this severe thunderstorm include gannon, lake sweetwater, camp boothe oaks and stith. This includes interstate 20 between mile markers 238 and 266. 6/23/2017 6:23 PM CDT At 623 pm cdt, a severe thunderstorm was located 8 miles south of merkel, or 19 miles west of abilene, moving southeast at 25 mph (radar indicated). Hazards include 60 mph wind gusts and quarter size hail. Hail damage to vehicles is expected. expect wind damage to roofs, siding, and trees. This severe thunderstorm will remain over mainly rural areas of northeastern nolan and northwestern taylor counties, including the following locations: camp butman. 6/23/2017 6:12 PM CDT At 611 pm cdt, a severe thunderstorm was located near trent, or 19 miles east of sweetwater, moving southeast at 30 mph (radar indicated). Hazards include 60 mph wind gusts and quarter size hail. Hail damage to vehicles is expected. expect wind damage to roofs, siding, and trees. this severe storm will be near, view around 630 pm cdt. Other locations impacted by this severe thunderstorm include camp butman. 6/23/2017 6:01 PM CDT At 601 pm cdt, a severe thunderstorm was located over trent, or 16 miles east of sweetwater, moving southeast at 30 mph (radar indicated). Hazards include 60 mph wind gusts and quarter size hail. Hail damage to vehicles is expected. expect wind damage to roofs, siding, and trees. this severe thunderstorm will be near, merkel around 610 pm cdt. 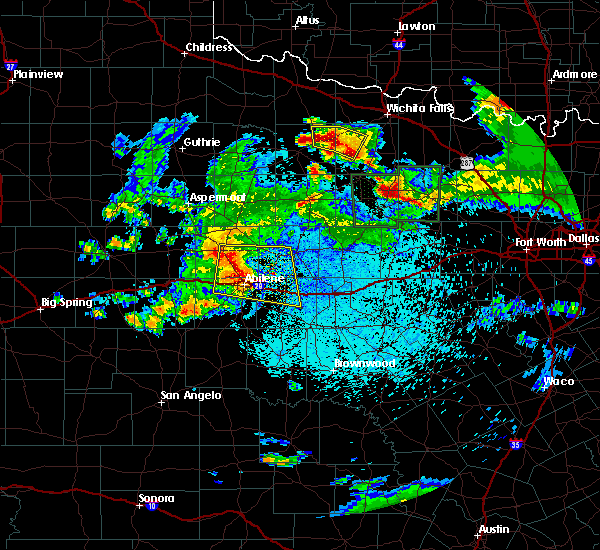 view around 635 pm cdt. other locations impacted by this severe thunderstorm include camp butman. This includes interstate 20 between mile markers 257 and 270. 6/15/2017 9:41 PM CDT At 939 pm cdt, a cluster of severe thunderstorms was located along a line from abilene to tuscola, moving east at 20 mph (radar indicated). Hazards include 60 mph wind gusts and penny size hail. Expect damage to roofs, siding, and trees. this severe storm will be near, dudley around 950 pm cdt. 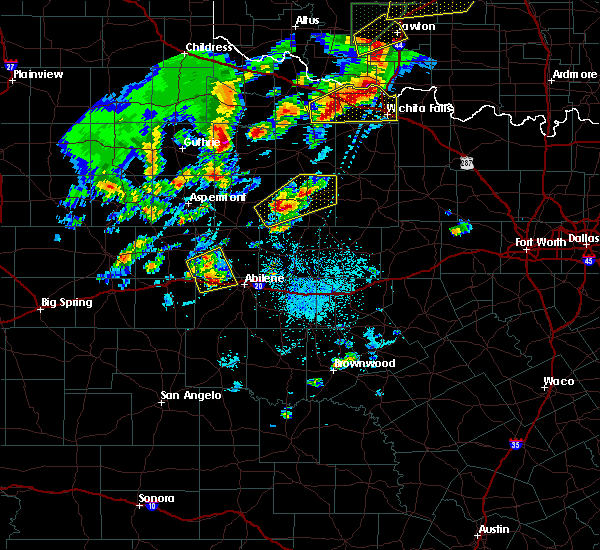 oplin around 1000 pm cdt. Other locations impacted by this severe thunderstorm include funston, impact, lake abilene, camp tonkawa, lake fort phantom hill, mccarty lake, ovalo, the intersection of us- 283 and highway 36, hodges and us-283 near the callahan- shackelford county line. 6/15/2017 9:12 PM CDT At 910 pm cdt, a severe thunderstorm was located over abilene, moving southeast at 25 mph (radar indicated). Hazards include 60 mph wind gusts and penny size hail. Expect damage to roofs, siding, and trees. this severe thunderstorm will be near, potosi around 920 pm cdt. tuscola around 920 pm cdt. clyde around 930 pm cdt. 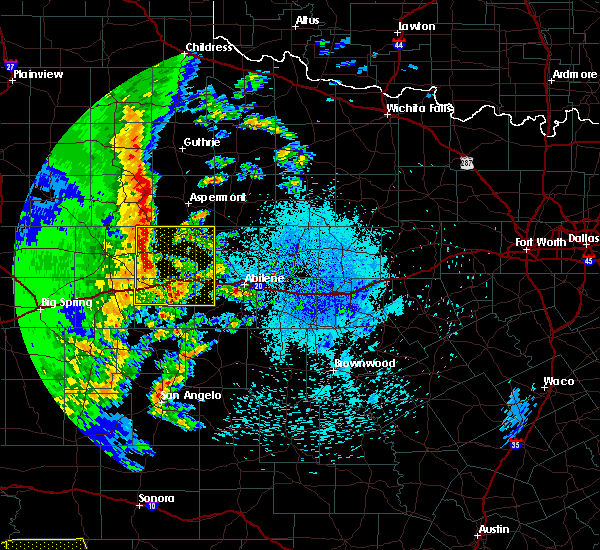 eula around 935 pm cdt. 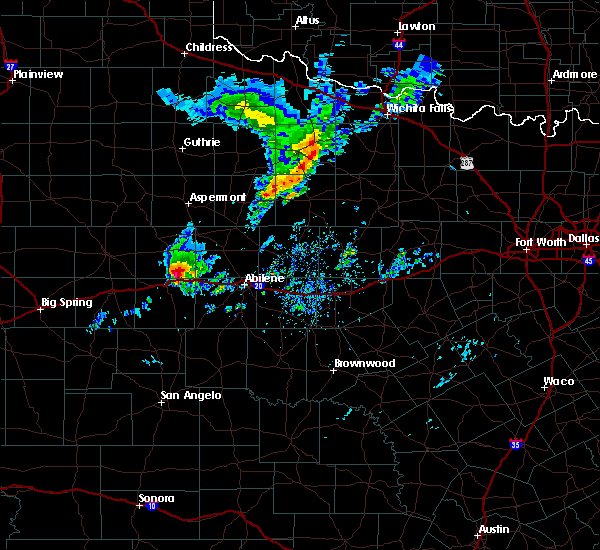 baird around 940 pm cdt. dudley around 940 pm cdt. other locations impacted by this severe thunderstorm include funston, impact, lake abilene, camp tonkawa, lake fort phantom hill, mccarty lake, ovalo, the intersection of us- 283 and highway 36, hodges and us-283 near the callahan- shackelford county line. This includes interstate 20 between mile markers 263 and 317. 6/15/2017 8:54 PM CDT At 852 pm cdt, a cluster of severe thunderstorms were located along a line from avoca to abilene to happy valley , moving southeast at 40 mph (radar indicated). Hazards include 60 mph wind gusts and quarter size hail. Hail damage to vehicles is expected. expect wind damage to roofs, siding, and trees. this severe storm will be near, potosi around 905 pm cdt. Other locations impacted by this severe thunderstorm include funston, impact, lake abilene, camp tonkawa, lake fort phantom hill, gannon, lake sweetwater, ovalo, busby and hodges. 6/15/2017 8:33 PM CDT At 830 pm cdt, a cluster of severe thunderstorms from sweetwater to merkel to stamford was moving southeast at 40 mph (radar indicated). Hazards include 60 mph wind gusts and quarter size hail. Hail damage to vehicles is expected. expect wind damage to roofs, siding, and trees. 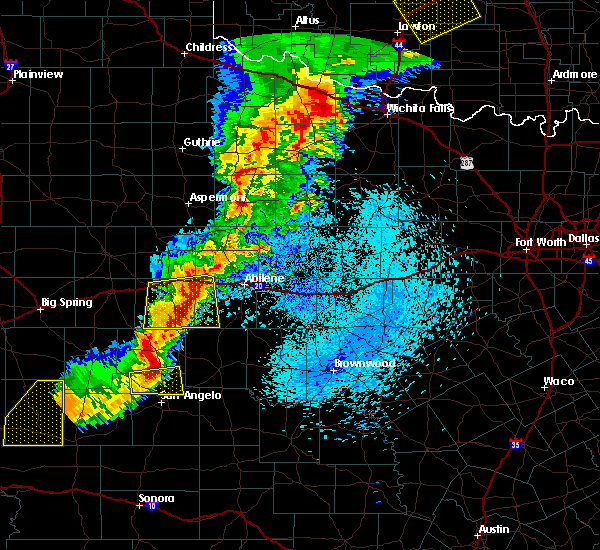 this severe thunderstorm will be near, tye, abilene, and dyess afb around 845 pm cdt. 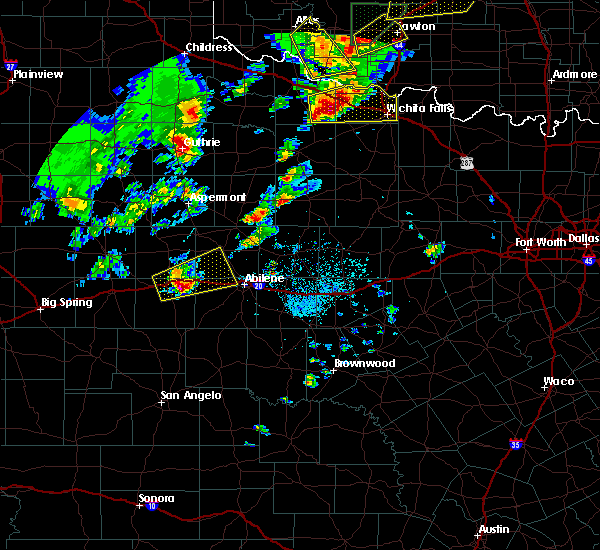 view around 850 pm cdt. buffalo gap around 855 pm cdt. potosi around 905 pm cdt. other locations impacted by this severe thunderstorm include funston, impact, lake abilene, camp tonkawa, lake fort phantom hill, gannon, lake sweetwater, ovalo, busby and hodges. This includes interstate 20 between mile markers 230 and 292. 6/15/2017 8:18 PM CDT At 815 pm cdt, a line of severe thunderstorms was located over southern fisher and northern nolan counties, moving southeast at 35 mph (radar indicated). Hazards include 60 mph wind gusts and quarter size hail. Hail damage to vehicles is expected. expect wind damage to roofs, siding, and trees. this severe storm will be near, nolan around 840 pm cdt. Other locations impacted by this severe thunderstorm include hitson, tuxedo, gannon, lake sweetwater, busby, capitola, the intersection of us-180 and ranch road 126, truby, camp butman and stith. 6/15/2017 7:57 PM CDT At 755 pm cdt, a cluster of severe thunderstorms was located over northwestern fisher county near roby and rotan, moving south at 35 mph (radar indicated). Hazards include 60 mph wind gusts and quarter size hail. Hail damage to vehicles is expected. expect wind damage to roofs, siding, and trees. this severe thunderstorm will be near, sweetwater around 810 pm cdt. nolan around 840 pm cdt. other locations impacted by this severe thunderstorm include hitson, tuxedo, gannon, lake sweetwater, busby, capitola, the intersection of us-180 and ranch road 126, truby, camp butman and stith. This includes interstate 20 between mile markers 229 and 274. 6/2/2017 8:11 PM CDT At 810 pm cdt, a severe thunderstorm was located near merkel, or 19 miles east of sweetwater, moving east at 25 mph (radar indicated). Hazards include 60 mph wind gusts and quarter size hail. Hail damage to vehicles is expected. expect wind damage to roofs, siding, and trees. 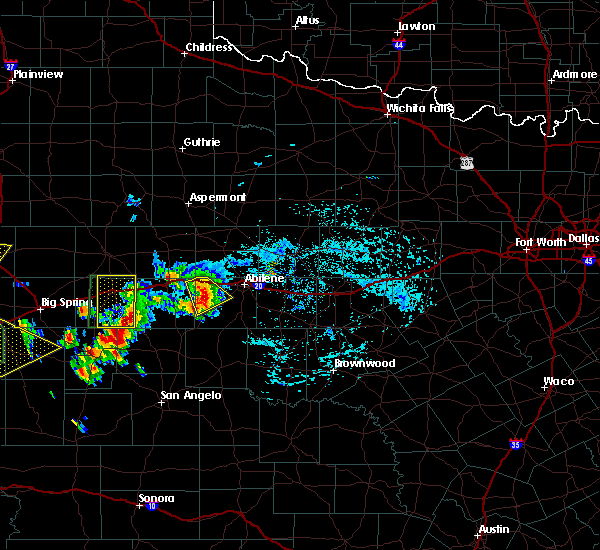 this severe storm will be near, merkel around 820 pm cdt. 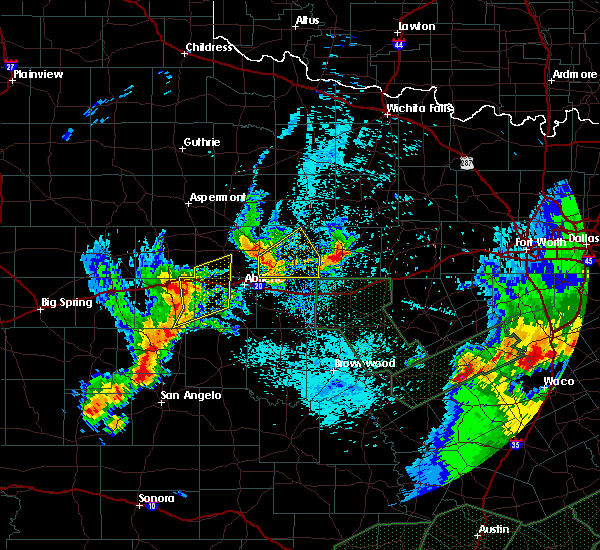 tye, dyess afb and view around 830 pm cdt. Other locations impacted by this severe thunderstorm include lake abilene, camp tonkawa, camp butman and lake sweetwater. 6/2/2017 7:30 PM CDT At 729 pm cdt, a severe thunderstorm was located near sweetwater, moving east at 30 mph (radar indicated). Hazards include 60 mph wind gusts and quarter size hail. Hail damage to vehicles is expected. expect wind damage to roofs, siding, and trees. this severe thunderstorm will be near, nolan around 745 pm cdt. trent around 805 pm cdt. merkel around 815 pm cdt. 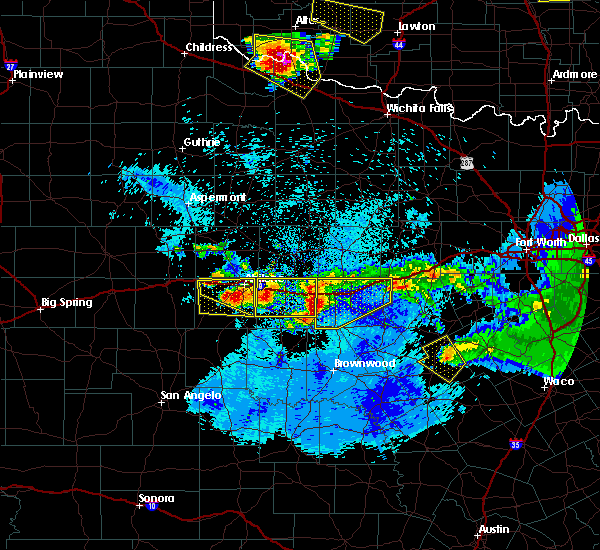 tye, dyess afb and view around 830 pm cdt. other locations impacted by this severe thunderstorm include lake abilene, camp tonkawa, camp butman, the intersection of highway 70 and ranch road 53, lake sweetwater and camp boothe oaks. This includes interstate 20 between mile markers 240 and 280. 5/19/2017 8:44 AM CDT At 844 am cdt, a severe thunderstorm was located near longworth, or 13 miles northeast of sweetwater, moving northeast at 50 mph (radar indicated). Hazards include 60 mph wind gusts and quarter size hail. Hail damage to vehicles is expected. expect wind damage to roofs, siding, and trees. this severe thunderstorm will be near, mccaulley around 855 am cdt. neinda around 905 am cdt. other locations impacted by this severe thunderstorm include hodges, the intersection of us- 180 and ranch road 126, gannon, truby, stith, lake sweetwater, busby, camp boothe oaks and capitola. This includes interstate 20 between mile markers 235 and 275. 5/19/2017 5:29 AM CDT At 528 am cdt, a severe thunderstorm was located 7 miles north of nolan, or 13 miles southeast of sweetwater, moving east at 30 mph (radar indicated). Hazards include 60 mph wind gusts and quarter size hail. Hail damage to vehicles is expected. expect wind damage to roofs, siding, and trees. Locations impacted include, nolan, merkel, trent, camp butman, the intersection of highway 70 and ranch road 53 and lake sweetwater. 5/19/2017 4:58 AM CDT At 457 am cdt, a severe thunderstorm was located near maryneal, or 9 miles southeast of roscoe, moving east at 25 mph (radar indicated). Hazards include 60 mph wind gusts and quarter size hail. Hail damage to vehicles is expected. Expect wind damage to roofs, siding, and trees. 5/16/2017 11:58 PM CDT At 1157 pm cdt, a severe thunderstorm was located near nolan, or 13 miles northeast of blackwell, moving east at 50 mph (radar indicated). Hazards include 70 mph wind gusts and quarter size hail. Hail damage to vehicles is expected. expect considerable tree damage. wind damage is also likely to mobile homes, roofs, and outbuildings. This severe thunderstorm will remain over mainly rural areas of nolan and western taylor counties, including the following locations: camp butman, the intersection of highway 70 and ranch road 53, lake sweetwater, the intersection of ranch road 608 and highway 147 and camp boothe oaks. 5/16/2017 11:43 PM CDT At 1142 pm cdt, a severe thunderstorm was located near maryneal, or 9 miles northwest of blackwell, moving east at 50 mph (radar indicated). Hazards include 70 mph wind gusts and quarter size hail. Hail damage to vehicles is expected. expect considerable tree damage. wind damage is also likely to mobile homes, roofs, and outbuildings. this severe thunderstorm will be near, nolan around 1155 pm cdt. other locations impacted by this severe thunderstorm include camp butman, the intersection of highway 70 and ranch road 53, lake sweetwater, the intersection of ranch road 608 and highway 147, camp boothe oaks and i-20 near the nolan-mitchell county line. This includes interstate 20 between mile markers 229 and 270. 5/10/2017 8:44 PM CDT At 844 pm cdt, a severe thunderstorm was located near happy valley, or 15 miles east of blackwell, moving northeast at 15 mph (radar indicated). Hazards include 60 mph wind gusts and quarter size hail. Hail damage to vehicles is expected. Expect wind damage to roofs, siding, and trees. 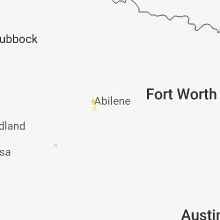 5/10/2017 8:15 PM CDT At 814 pm cdt, a severe thunderstorm was located near view, or 16 miles southwest of abilene, moving northeast at 35 mph (radar indicated). Hazards include 60 mph wind gusts and quarter size hail. Hail damage to vehicles is expected. Expect wind damage to roofs, siding, and trees. 3/28/2017 10:36 PM CDT At 1035 pm cdt, severe thunderstorms were located along a line extending from near weinert to near lueders to hamby to oplin, moving east at 25 mph (radar indicated). Hazards include 60 mph wind gusts and penny size hail. Expect damage to roofs, siding, and trees. these severe storms will be near, clyde, eula, oplin and dudley around 1040 pm cdt. 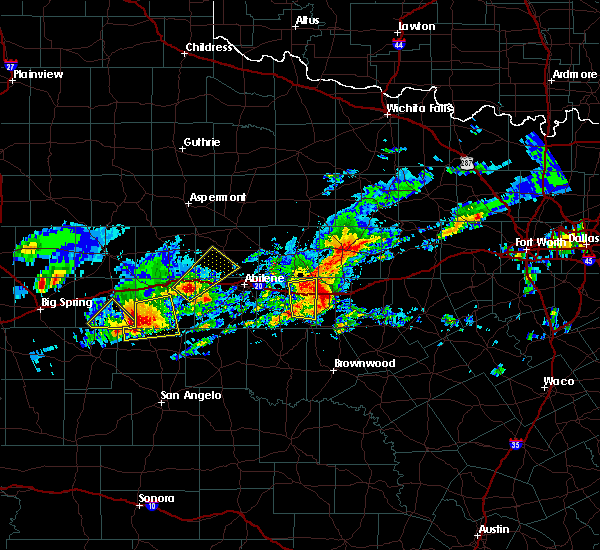 baird around 1100 pm cdt. Albany and putnam around 1115 pm cdt. 3/28/2017 10:14 PM CDT At 1013 pm cdt, severe thunderstorms were located along a line extending from near weinert to near stamford to near hawley to near dyess afb to near lawn, moving east at 45 mph (radar indicated). Hazards include 60 to 70 mph wind gusts and penny size hail. Expect considerable tree damage. damage is likely to mobile homes, roofs, and outbuildings. severe thunderstorms will be near, oplin, hamby and nugent around 1020 pm cdt. lueders, potosi and dudley around 1025 pm cdt. 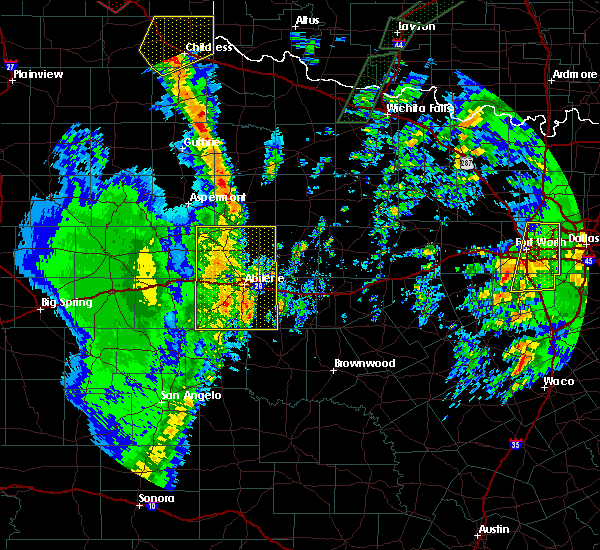 clyde and eula around 1030 pm cdt. 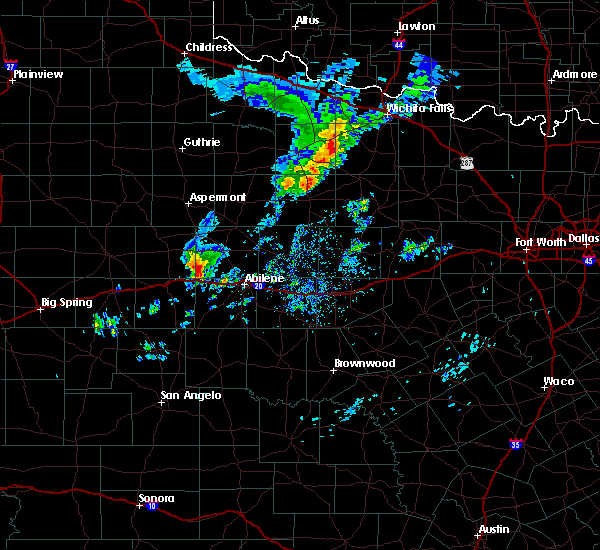 baird around 1040 pm cdt. 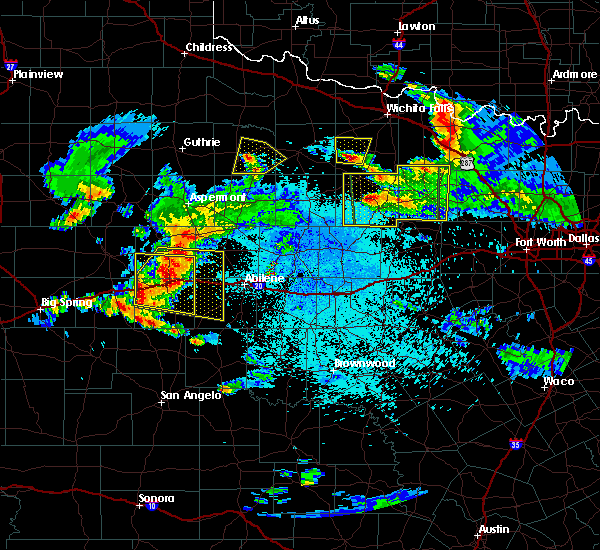 albany, throckmorton, cross plains, moran and fort griffin around 1050 pm cdt. putnam around 1055 pm cdt. atwell around 1100 pm cdt. elbert around 1105 pm cdt. 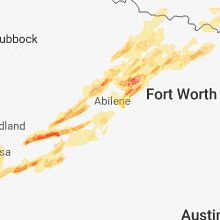 other locations impacted by these severe thunderstorms include funston, us-180 near the shackelford-stephens county line, us- 183 near the throckmorton- stephens county line, admiral, big country baptist assembly, the intersection of us- 180 and farm road 600, impact, lake abilene, camp tonkawa and tuxedo. This includes interstate 20 between mile markers 265 and 323. 3/28/2017 10:00 PM CDT At 1000 pm cdt, severe thunderstorms were located along a line extending from neinda to 6 miles northeast of noodle to near tye to near view to near bradshaw, moving east at 50 mph (radar indicated). Hazards include 60 mph wind gusts and penny size hail. Expect damage to roofs, siding, and trees. 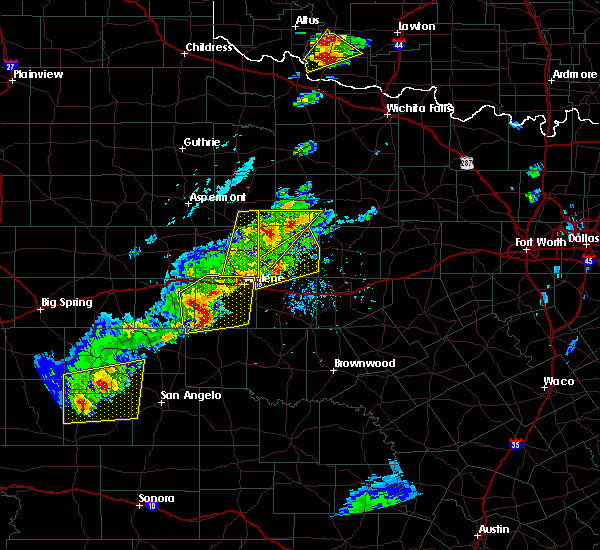 these severe storms will be near, anson, tye, tuscola and dyess afb around 1005 pm cdt. hawley and lawn around 1010 pm cdt. 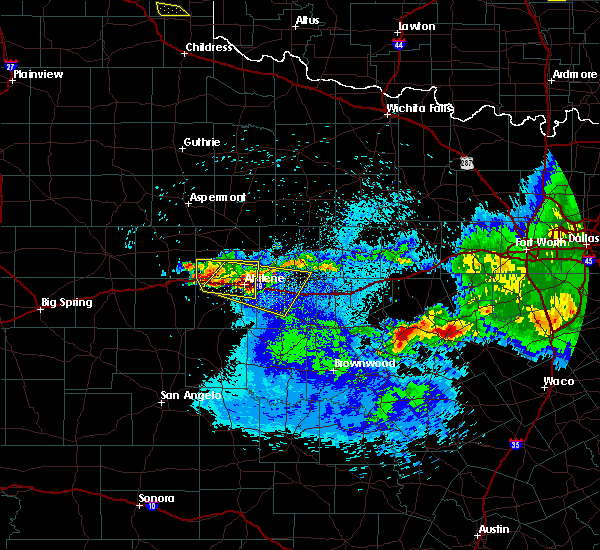 abilene, nugent and potosi around 1020 pm cdt. avoca around 1025 pm cdt. Other locations impacted by these severe thunderstorms include funston, impact, lake abilene, camp tonkawa, hitson, lake fort phantom hill, lake sweetwater, ovalo, hodges and the intersection of us-180 and ranch road 126. 3/28/2017 9:41 PM CDT At 940 pm cdt, severe thunderstorms were located along a line extending from near rotan to 7 miles southwest of trent to blackwell, moving east at 35 mph (radar indicated). Hazards include 70 mph wind gusts and quarter size hail. Hail damage to vehicles is expected. expect considerable tree damage. wind damage is also likely to mobile homes, roofs, and outbuildings. severe thunderstorms will be near, trent and hylton around 955 pm cdt. 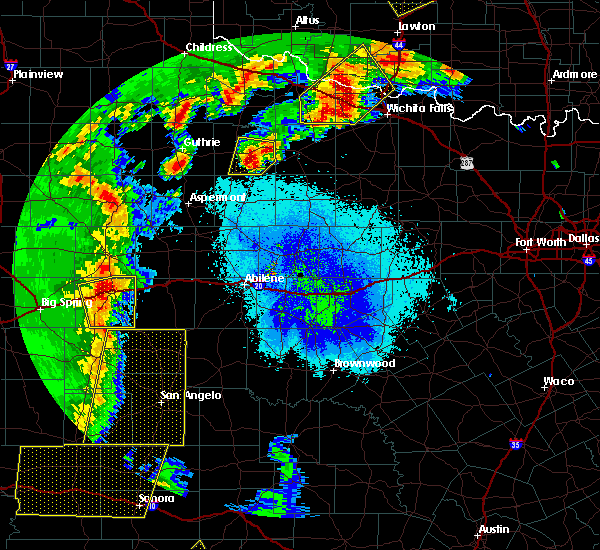 merkel and sylvester around 1000 pm cdt. mccaulley and happy valley around 1005 pm cdt. 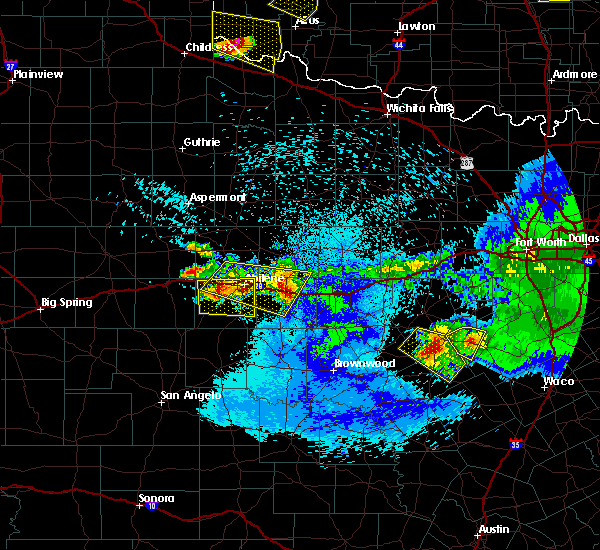 hamlin, neinda, dyess afb and view around 1015 pm cdt. 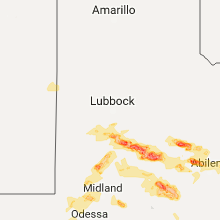 tye around 1020 pm cdt. 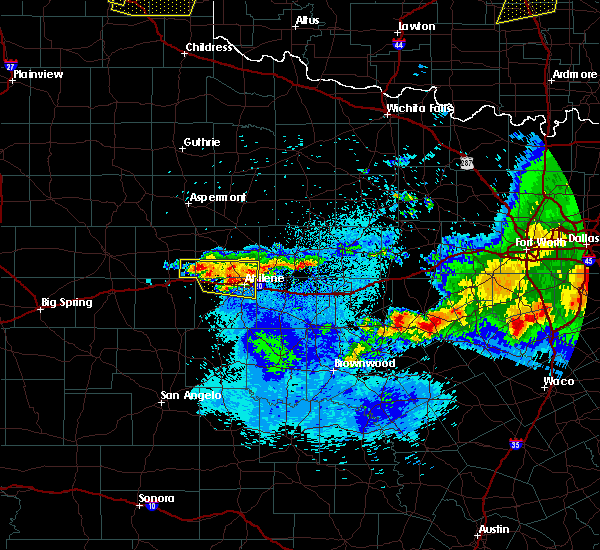 bradshaw and abilene around 1025 pm cdt. anson, tuscola and potosi around 1035 pm cdt. lawn around 1040 pm cdt. other locations impacted by these severe thunderstorms include funston, impact, lake abilene, camp tonkawa, hitson, lake fort phantom hill, gannon, lake sweetwater, ovalo and busby. This includes interstate 20 between mile markers 236 and 291. 3/28/2017 8:54 PM CDT At 852 pm cdt, severe thunderstorms were located along a line extending from near hudd to silver, moving east at 50 mph (radar indicated). Hazards include 60 mph wind gusts and quarter size hail. Hail damage to vehicles is expected. expect wind damage to roofs, siding, and trees. 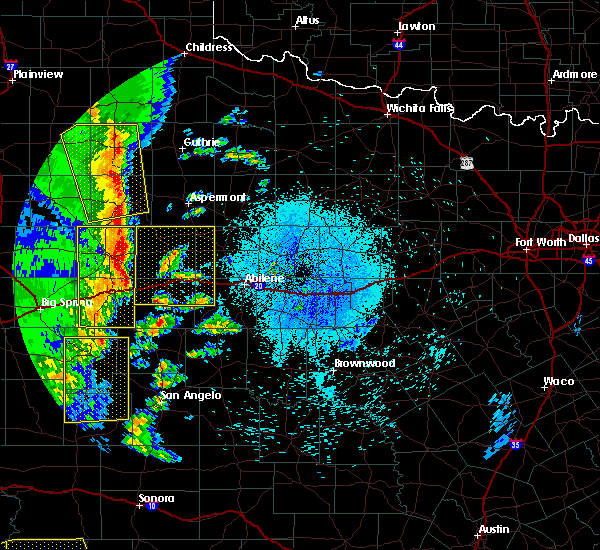 severe thunderstorms will be near, rotan around 910 pm cdt. 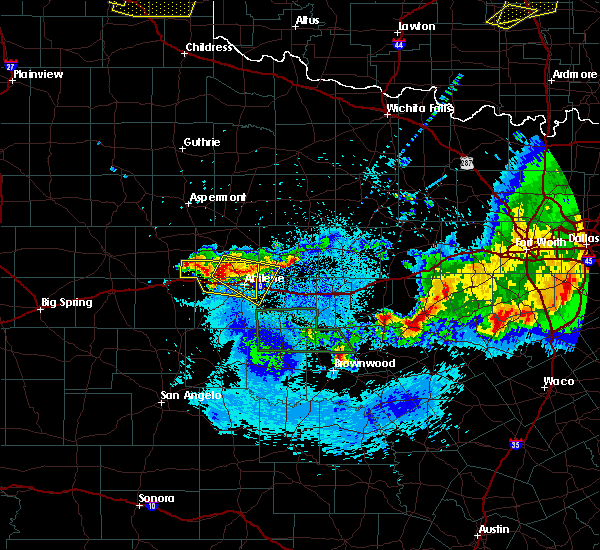 blackwell around 920 pm cdt. hylton around 925 pm cdt. hamlin around 930 pm cdt. happy valley around 935 pm cdt. other locations impacted by these severe thunderstorms include the intersection of us- 180 and ranch road 126, hitson, gannon, camp butman, the intersection of highway 70 and ranch road 53, lake sweetwater, the intersection of ranch road 608 and highway 147, busby, camp boothe oaks and capitola. this includes interstate 20 between mile markers 230 and 267. A tornado watch remains in effect until 1100 pm cdt for west central texas. 3/28/2017 5:31 PM CDT At 529 pm cdt, a severe thunderstorm was located near nolan, or 11 miles southeast of sweetwater, moving north at 30 mph (radar indicated). Hazards include 60 mph wind gusts and half dollar size hail. Hail damage to vehicles is expected. expect wind damage to roofs, siding, and trees. this severe storm will be near, sweetwater around 545 pm cdt. other locations impacted by this severe thunderstorm include camp butman, stith, the intersection of highway 70 and ranch road 53 and lake sweetwater. 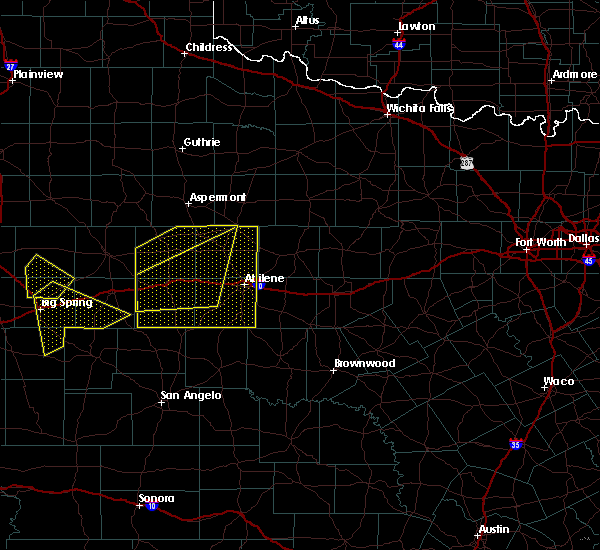 A tornado watch remains in effect until 1100 pm cdt for west central texas. 3/28/2017 5:05 PM CDT At 504 pm cdt, a severe thunderstorm was located near blackwell, moving north at 40 mph (radar indicated). Hazards include ping pong ball size hail and 60 mph wind gusts. People and animals outdoors will be injured. expect hail damage to roofs, siding, windows, and vehicles. expect wind damage to roofs, siding, and trees. this severe thunderstorm will be near, nolan around 515 pm cdt. trent around 540 pm cdt. other locations impacted by this severe thunderstorm include camp butman, stith, the intersection of highway 70 and ranch road 53 and lake sweetwater. this includes interstate 20 between mile markers 244 and 272. A tornado watch remains in effect until 1100 pm cdt for west central texas. 3/28/2017 4:56 PM CDT At 454 pm cdt, a confirmed tornado was located over hawley, or 10 miles west of abilene, and is moving northeast at 35 mph (weather spotters confirmed tornado. 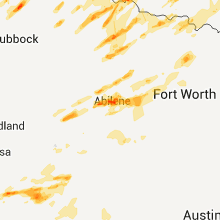 at 450 pm trained spotters reported a tornado 5 miles west of dyess afb). Hazards include damaging tornado and golf ball size hail. Flying debris will be dangerous to those caught without shelter. mobile homes will be damaged or destroyed. damage to roofs, windows, and vehicles will occur. tree damage is likely. this tornado will be near, nugent around 505 pm cdt. Other locations impacted by this tornadic thunderstorm include funston, hodges, impact, lake fort phantom hill, truby and stith. 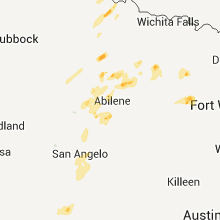 3/28/2017 4:48 PM CDT At 447 pm cdt, a funnel cloud was located near tye, or 9 miles northwest of abilene, and is nearly stationary (weather spotters confirmed a funnel cloud). Hazards include golf ball size hail. Flying debris will be dangerous to those caught without shelter. mobile homes will be damaged or destroyed. damage to roofs, windows, and vehicles will occur. tree damage is likely. this tornado will be near, hawley around 455 pm cdt. 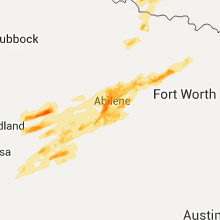 abilene around 500 pm cdt. nugent around 505 pm cdt. Other locations impacted by this tornadic thunderstorm include funston, hodges, impact, lake fort phantom hill, truby and stith. 3/28/2017 4:38 PM CDT At 438 pm cdt, a severe thunderstorm capable of producing a tornado was located near dyess afb, or 12 miles west of abilene, moving northeast at 50 mph (radar indicated rotation). Hazards include tornado and golf ball size hail. Flying debris will be dangerous to those caught without shelter. mobile homes will be damaged or destroyed. damage to roofs, windows, and vehicles will occur. tree damage is likely. this dangerous storm will be near, hawley around 455 pm cdt. 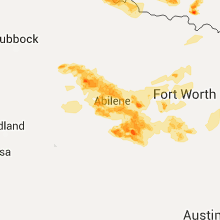 abilene around 500 pm cdt. nugent around 505 pm cdt. other locations impacted by this tornadic thunderstorm include funston, hodges, impact, lake fort phantom hill, truby and stith. This includes interstate 20 between mile markers 265 and 285. 5/29/2016 1:15 AM CDT At 114 am cdt, a severe thunderstorm was located near hamby, or 11 miles northwest of clyde, moving east at 40 mph (radar indicated). Hazards include 70 mph wind gusts and quarter size hail. Hail damage to vehicles is expected. expect considerable tree damage. wind damage is also likely to mobile homes, roofs, and outbuildings. this severe thunderstorm will remain over mainly rural areas of northwestern callahan, northeastern taylor, southwestern shackelford and southeastern jones counties, including the following locations: impact, admiral, hodges, mccarty lake, truby, stith, us-283 near the callahan-shackelford county line, lake fort phantom hill, funston and kirby lake. This includes interstate 20 between mile markers 271 and 314. 5/29/2016 12:41 AM CDT At 1240 am cdt, a severe thunderstorm was located near tye, or 12 miles west of abilene, moving east at 35 mph (radar indicated). Hazards include 70 mph wind gusts and quarter size hail. Hail damage to vehicles is expected. expect considerable tree damage. wind damage is also likely to mobile homes, roofs, and outbuildings. this severe thunderstorm will be near, tye and dyess afb around 1250 am cdt. hamby around 110 am cdt. clyde around 120 am cdt. baird around 135 am cdt. Other locations impacted by this severe thunderstorm include. 5/29/2016 12:32 AM CDT At 1231 am cdt, a severe thunderstorm was located over trent, or 18 miles east of sweetwater, moving east at 35 mph (radar indicated). Hazards include 60 mph wind gusts and quarter size hail. Hail damage to vehicles is expected. expect wind damage to roofs, siding, and trees. 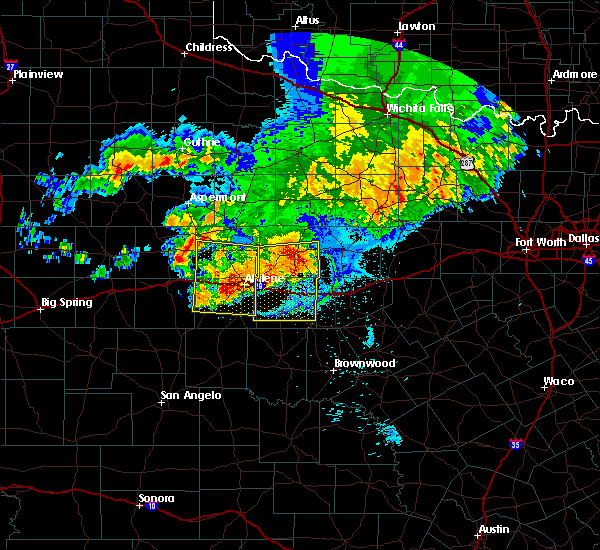 this severe storm will be near, noodle around 1235 am cdt. merkel around 1240 am cdt. other locations impacted by this severe thunderstorm include lake sweetwater, the intersection of highway 70 and ranch road 53, truby, stith, gannon, busby, camp boothe oaks, camp butman and the intersection of ranch road 608 and highway 147. This includes interstate 20 between mile markers 229 and 274. 5/29/2016 12:09 AM CDT At 1208 am cdt, a severe thunderstorm was located near sweetwater, moving east at 20 mph (radar indicated). Hazards include ping pong ball size hail and 60 mph wind gusts. People and animals outdoors will be injured. expect hail damage to roofs, siding, windows, and vehicles. expect wind damage to roofs, siding, and trees. this severe thunderstorm will be near, trent around 1245 am cdt. merkel around 100 am cdt. other locations impacted by this severe thunderstorm include lake sweetwater, capitola, the intersection of highway 70 and ranch road 53, truby, stith, gannon, busby, camp boothe oaks, camp butman and the intersection of ranch road 608 and highway 147. This includes interstate 20 between mile markers 229 and 274. 5/28/2016 8:23 PM CDT Hen Egg sized hail reported 2.9 miles NNW of Merkel, TX, quarter to billiard ball size hail stones found along fm 1235 southeast of merkel. 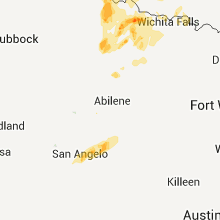 5/28/2016 8:12 PM CDT At 812 pm cdt, a severe thunderstorm was located near merkel, or 16 miles west of abilene, moving east at 25 mph (radar indicated). Hazards include 60 mph wind gusts and quarter size hail. Hail damage to vehicles is expected. expect wind damage to roofs, siding, and trees. this severe thunderstorm will be near, tye and dyess afb around 835 pm cdt. potosi around 900 pm cdt. other locations impacted by this severe thunderstorm include impact and kirby lake. This includes interstate 20 between mile markers 264 and 292. 5/27/2016 1:13 AM CDT At 113 am cdt, severe thunderstorms were located along a line extending from near trent to near nolan to near hylton, moving northeast at 40 mph (radar indicated). Hazards include 60 mph wind gusts and penny size hail. Expect damage to roofs. siding. and trees. 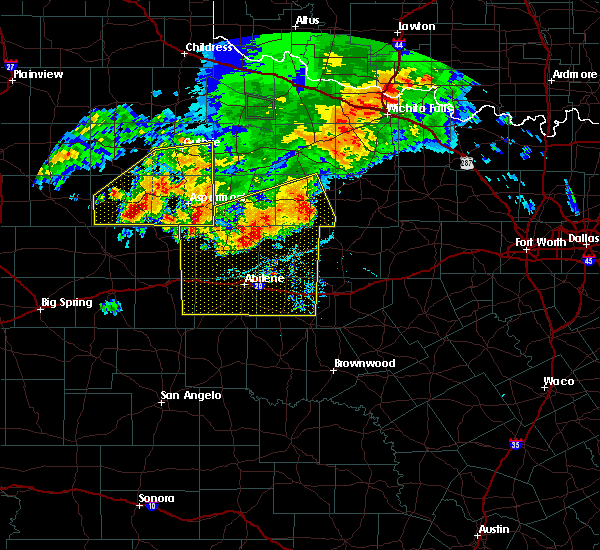 severe thunderstorms will be near, trent around 120 am cdt. noodle around 130 am cdt. 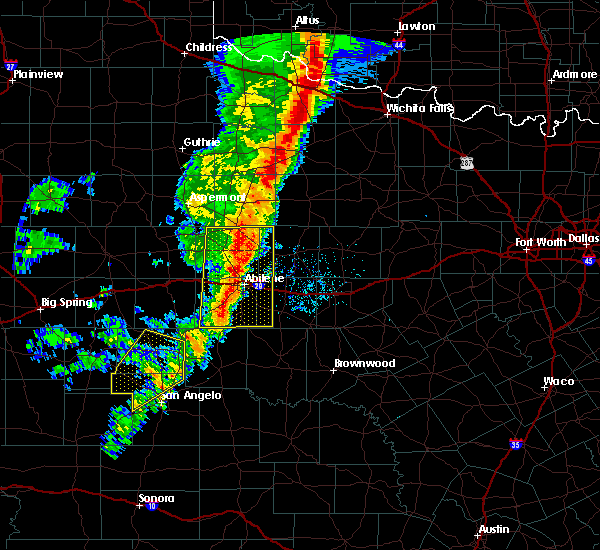 merkel around 135 am cdt. tye, view and dyess afb around 145 am cdt. other locations impacted by these severe thunderstorms include hodges, camp butman, truby and stith. This includes interstate 20 between mile markers 253 and 278. 5/12/2016 1:37 AM CDT At 136 am cdt, a severe thunderstorm was located near buffalo gap, or 7 miles southwest of abilene, moving east at 20 mph. another severe thunderstorm was located near merkel, moving southeast at 20 mph (radar indicated). Hazards include golf ball size hail and 60 mph wind gusts. People and animals outdoors will be injured. expect hail damage to roofs, siding, windows, and vehicles. expect wind damage to roofs, siding, and trees. this severe thunderstorm will be near, potosi around 210 am cdt. 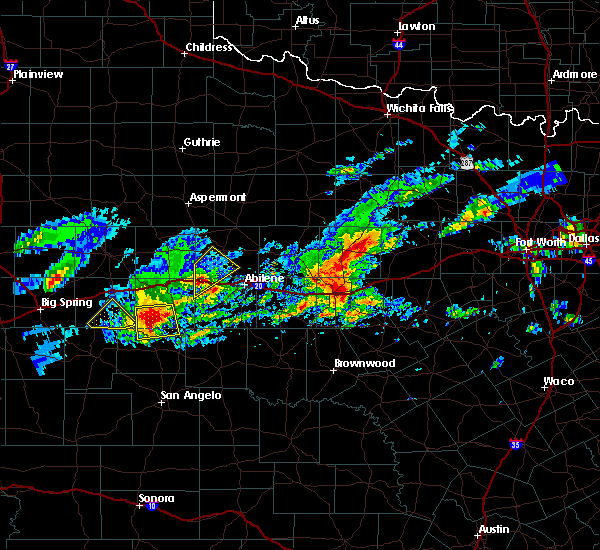 view around 215 am cdt. other locations impacted by this severe thunderstorm include impact and kirby lake. This includes interstate 20 between mile markers 263 and 292. 5/12/2016 1:21 AM CDT At 120 am cdt, a severe thunderstorm was located near buffalo gap, or 8 miles southwest of abilene, moving southeast at 30 mph (radar indicated). Hazards include 60 mph wind gusts and half dollar size hail. Hail damage to vehicles is expected. expect wind damage to roofs, siding, and trees. this severe storm will be near, tuscola and potosi around 130 am cdt. other locations impacted by this severe thunderstorm include impact, kirby lake, lake abilene and camp tonkawa. This includes interstate 20 between mile markers 263 and 292. 5/12/2016 1:02 AM CDT At 101 am cdt, a severe thunderstorm was located over abilene, moving southeast at 30 mph. another severe thunderstorm was located 3 miles east of merkel, moving southeast at 30 mph (radar indicated). Hazards include golf ball size hail and 60 mph wind gusts. People and animals outdoors will be injured. expect hail damage to roofs, siding, windows, and vehicles. expect wind damage to roofs, siding, and trees. this severe thunderstorm will be near, potosi and view around 105 am cdt. other locations impacted by this severe thunderstorm include impact, kirby lake, lake abilene and camp tonkawa. This includes interstate 20 between mile markers 263 and 292. 5/12/2016 12:47 AM CDT At 1242 am cdt, a severe thunderstorm was located over clyde, moving southeast at 30 mph. 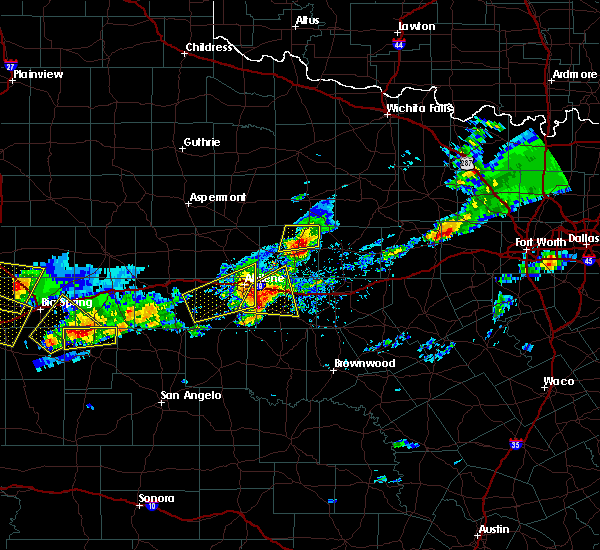 another severe thunderstorm was located over merkel, moving southeast at 30 mph (radar indicated). Hazards include ping pong ball size hail and 60 mph wind gusts. People and animals outdoors will be injured. expect hail damage to roofs, siding, windows, and vehicles. expect wind damage to roofs, siding, and trees. 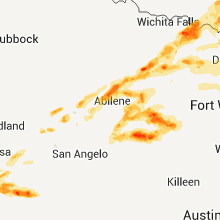 These severe thunderstorms will be near clyde and baird through 100am cdt, tye and merkel through 115 am cdt, abilene by 115 am cdt, this includes interstate 20 between mile markers 267 and 314. 5/12/2016 12:19 AM CDT At 1217 am cdt, a severe thunderstorm was located near abilene, moving east at 30 mph. another severe thunderstorm was located over merkel, moving southeast at 30 mph (radar indicated). Hazards include ping pong ball size hail. People and animals outdoors will be injured. expect damage to roofs, siding, windows, and vehicles. 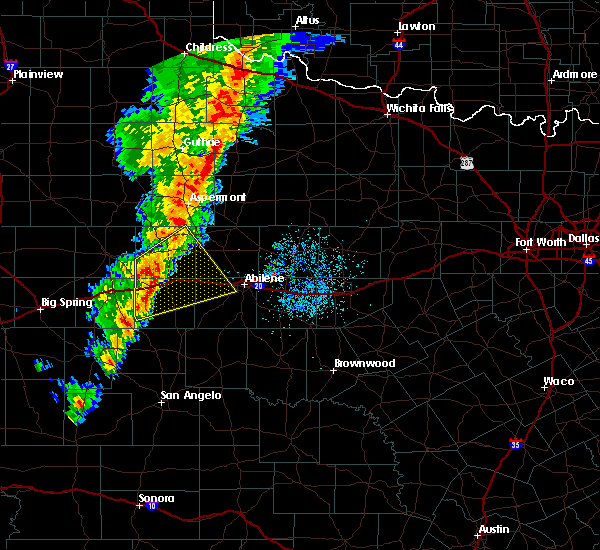 this severe thunderstorm will be near, clyde and eula around 1230 am cdt. 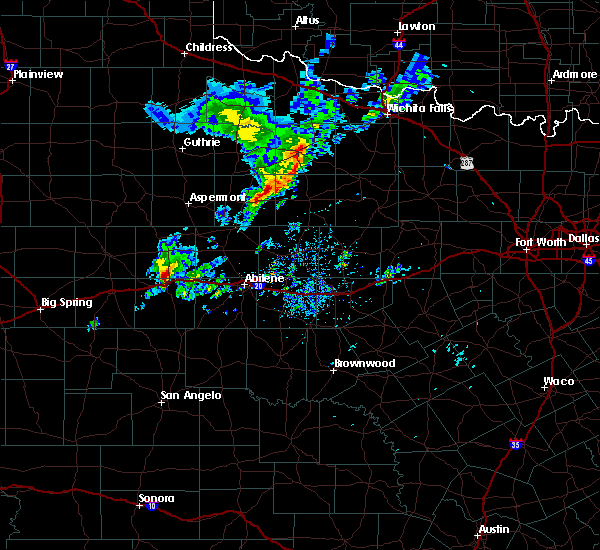 baird around 1240 am cdt. other locations impacted by this severe thunderstorm include impact, hodges, the intersection of us-283 and highway 36, stith, us-283 near the callahan-shackelford county line, lake fort phantom hill and kirby lake. This includes interstate 20 between mile markers 267 and 314. 5/12/2016 12:10 AM CDT At 1208 am cdt, a severe thunderstorm was located over abilene, moving east at 30 mph. another severe thunderstorm was located just north of merkel, moving east at 30 mph (radar indicated). Hazards include golf ball size hail and 60 mph wind gusts. People and animals outdoors will be injured. expect hail damage to roofs, siding, windows, and vehicles. expect wind damage to roofs, siding, and trees. this severe storm will be near, hamby around 1215 am cdt. potosi around 1220 am cdt. other locations impacted by this severe thunderstorm include impact, lake fort phantom hill, hodges, kirby lake, truby and stith. This includes interstate 20 between mile markers 262 and 292. 5/11/2016 11:55 PM CDT At 1155 pm cdt, a severe thunderstorm was located over tye, or 7 miles west of abilene, moving east at 15 mph (radar indicated). Hazards include golf ball size hail and 60 mph wind gusts. People and animals outdoors will be injured. expect hail damage to roofs, siding, windows, and vehicles. expect wind damage to roofs, siding, and trees. this severe storm will be near, potosi and hamby around 1230 am cdt. other locations impacted by this severe thunderstorm include impact, lake fort phantom hill, hodges, kirby lake, truby and stith. This includes interstate 20 between mile markers 262 and 292. 5/11/2016 11:39 PM CDT At 1138 pm cdt, a severe thunderstorm was located near tye, or 11 miles northwest of abilene, moving east at 30 mph (radar indicated). Hazards include 60 mph wind gusts and half dollar size hail. Hail damage to vehicles is expected. expect wind damage to roofs, siding, and trees. this severe thunderstorm will be near, hawley and dyess afb around 1145 pm cdt. hamby and potosi around 1210 am cdt. other locations impacted by this severe thunderstorm include impact, lake fort phantom hill, hodges, kirby lake, truby and stith. This includes interstate 20 between mile markers 262 and 292. 5/8/2016 4:51 PM CDT At 450 pm cdt, a severe thunderstorm was located 9 miles north of happy valley, or 19 miles northeast of blackwell, moving east at 45 mph (radar indicated). Hazards include 70 mph wind gusts and ping pong ball size hail. People and animals outdoors will be injured. expect hail damage to roofs, siding, windows, and vehicles. expect considerable tree damage. wind damage is also likely to mobile homes, roofs, and outbuildings. this severe storm will be near, view around 505 pm cdt. 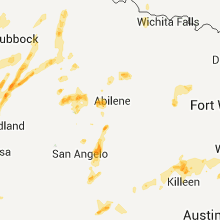 tuscola, buffalo gap and dyess afb around 510 pm cdt. potosi around 515 pm cdt. other locations impacted by this severe thunderstorm include impact, lake abilene, camp tonkawa, drasco, ovalo, kirby lake, camp butman and us-277 near the runnels-nolan-taylor county intersection. This includes interstate 20 between mile markers 263 and 291. 5/8/2016 4:29 PM CDT At 429 pm cdt, a severe thunderstorm was located over blackwell, moving northeast at 45 mph (radar indicated). Hazards include 70 mph wind gusts and ping pong ball size hail. People and animals outdoors will be injured. expect hail damage to roofs, siding, windows, and vehicles. expect considerable tree damage. wind damage is also likely to mobile homes, roofs, and outbuildings. this severe thunderstorm will be near, hylton and wingate around 440 pm cdt. happy valley around 445 pm cdt. view around 505 pm cdt. 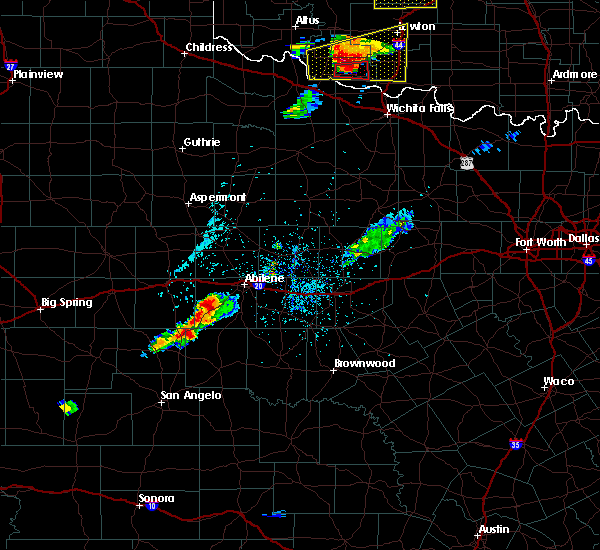 tuscola and buffalo gap around 510 pm cdt. potosi around 515 pm cdt. other locations impacted by this severe thunderstorm include impact, lake abilene, camp tonkawa, pumphrey, drasco, ovalo, kirby lake, camp butman and us-277 near the runnels-nolan-taylor county intersection. This includes interstate 20 between mile markers 263 and 291. 5/8/2016 3:59 PM CDT At 359 pm cdt, a severe thunderstorm was located near tye, or 9 miles west of abilene, moving northeast at 40 mph (radar indicated). Hazards include tennis ball size hail and 60 mph wind gusts. People and animals outdoors will be injured. expect hail damage to roofs, siding, windows, and vehicles. expect wind damage to roofs, siding, and trees. this severe storm will be near, hawley around 415 pm cdt. 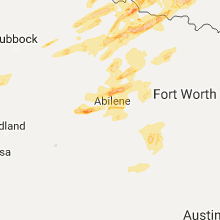 abilene around 420 pm cdt. nugent around 430 pm cdt. other locations impacted by this severe thunderstorm include impact, hodges, truby, stith, lake fort phantom hill, funston and the intersection of us-180 and farm road 600. This includes interstate 20 between mile markers 267 and 284. 5/8/2016 3:53 PM CDT At 352 pm cdt, a severe thunderstorm was located near tye, or 11 miles west of abilene, moving northeast at 40 mph (radar indicated). Hazards include ping pong ball size hail and 60 mph wind gusts. People and animals outdoors will be injured. expect hail damage to roofs, siding, windows, and vehicles. expect wind damage to roofs, siding, and trees. this severe thunderstorm will be near, hawley around 415 pm cdt. 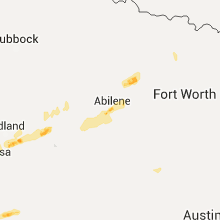 abilene around 420 pm cdt. nugent around 430 pm cdt. other locations impacted by this severe thunderstorm include impact, hodges, truby, stith, lake fort phantom hill, funston and the intersection of us-180 and farm road 600. This includes interstate 20 between mile markers 267 and 284. 4/26/2016 6:26 PM CDT At 625 pm cdt, a severe thunderstorm was located over view, or 12 miles southwest of abilene, moving east at 40 mph. this storm will approach abilene in the next 20 to 30 minutes (radar indicated). Hazards include 60 mph wind gusts and half dollar size hail. Hail damage to vehicles is expected. expect wind damage to roofs, siding, and trees. this severe storm will be near, buffalo gap and dyess afb around 630 pm cdt. tye around 635 pm cdt. potosi around 650 pm cdt. hamby around 655 pm cdt. other locations impacted by this severe thunderstorm include impact, ovalo, kirby lake, lake abilene, camp tonkawa and camp butman. this includes interstate 20 between mile markers 258 and 297. 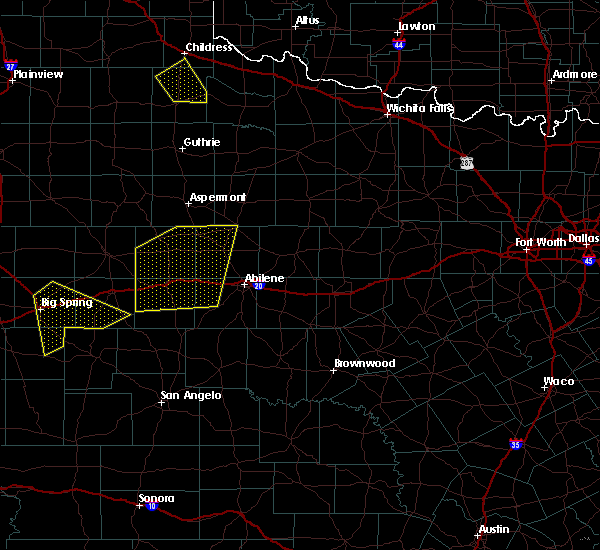 A tornado watch remains in effect until midnight cdt for west central texas. 4/26/2016 6:13 PM CDT At 613 pm cdt, a severe thunderstorm was located 9 miles west of view, or 19 miles southwest of abilene, moving east at 50 mph (radar indicated). Hazards include 60 mph wind gusts and half dollar size hail. Hail damage to vehicles is expected. expect wind damage to roofs, siding, and trees. this severe thunderstorm will be near, view and dyess afb around 625 pm cdt. tye and buffalo gap around 630 pm cdt. potosi around 640 pm cdt. hamby around 645 pm cdt. other locations impacted by this severe thunderstorm include impact, ovalo, kirby lake, lake abilene, camp tonkawa and camp butman. this includes interstate 20 between mile markers 258 and 297. 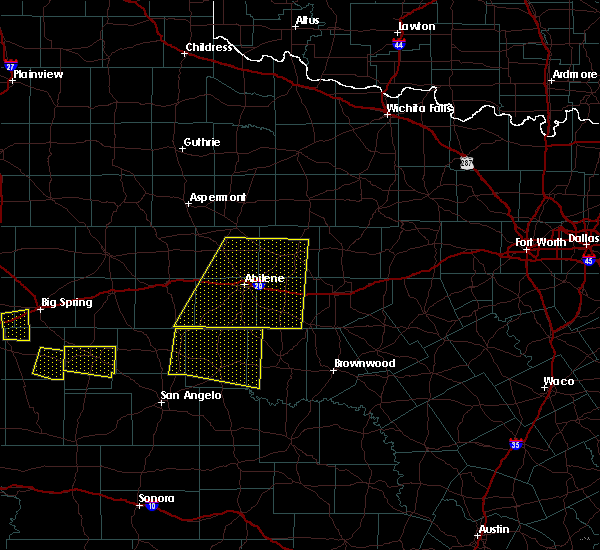 A tornado watch remains in effect until midnight cdt for west central texas. 11/16/2015 11:54 PM CST At 1153 pm cst, severe thunderstorms were located along a line extending from stamford to hawley to near bradshaw, moving east at 50 mph. 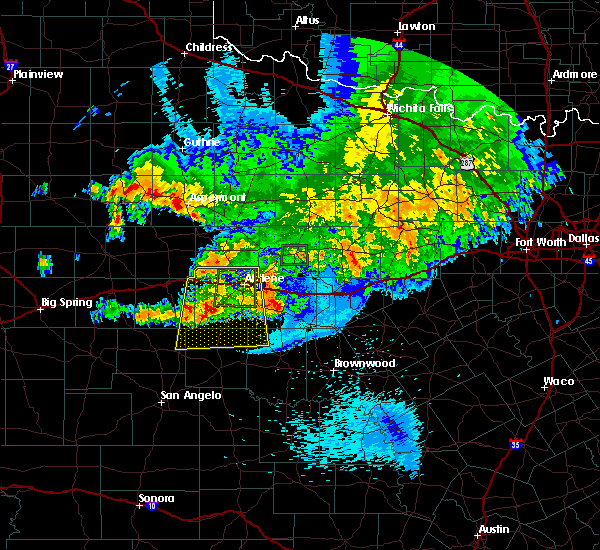 these severe thunderstorms will be moving across abilene through 1215 am (radar indicated). Hazards include 60 mph wind gusts and penny size hail. Expect damage to roofs. siding and trees. 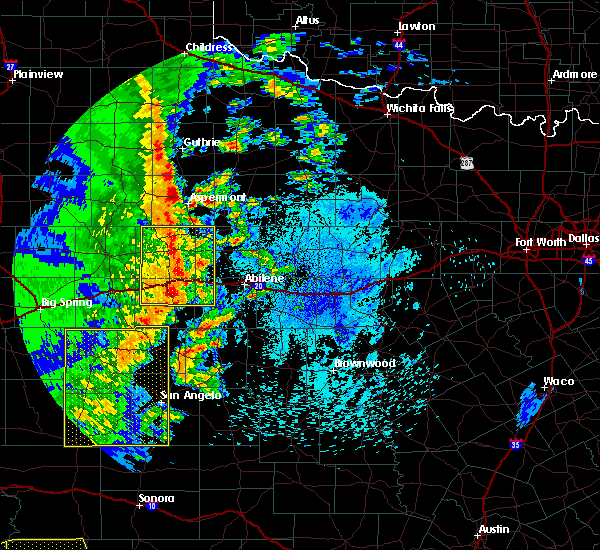 these severe storms will be near, abilene, avoca and nugent around 1200 am cst. stamford and hamby around 1205 am cst. oplin around 1215 am cst. Other locations impacted by these severe thunderstorms include. 11/16/2015 11:40 PM CST At 1139 pm cst, severe thunderstorms were located along a line extending from 9 miles west of stamford to near noodle to near happy valley, moving east at 50 mph (radar indicated). Hazards include 60 mph wind gusts and penny size hail. Expect damage to roofs. siding and trees. severe thunderstorms will be near, hawley around 1150 pm cst. bradshaw and avoca around 1155 pm cst. abilene and nugent around 1200 am cst. stamford, lawn and hamby around 1205 am cst. oplin around 1215 am cst. Other locations impacted by these severe thunderstorms include. 11/16/2015 11:09 PM CST At 1108 pm cst, severe thunderstorms were located along a line extending from near roby to near longworth to near maryneal, moving northeast at 50 mph (radar indicated). Hazards include 70 mph wind gusts and penny size hail. Expect considerable tree damage. damage is likely to mobile homes, roofs and outbuildings. these severe storms will be near, longworth around 1115 pm cst. sylvester around 1120 pm cst. mccaulley around 1125 pm cst. other locations impacted by these severe thunderstorms include lake sweetwater, capitola, the intersection of highway 70 and ranch road 53, hitson, stith, gannon, busby, camp boothe oaks, the intersection of us- 180 and ranch road 126 and camp butman. this includes interstate 20 between mile markers 231 and 278. a tornado watch remains in effect until 200 am cst for west central texas. A tornado watch also remains in effect until 300 am cst for west central texas. 11/16/2015 10:53 PM CST At 1052 pm cst, a severe thunderstorm was located near sweetwater, moving northeast at 70 mph (radar indicated). Hazards include 70 mph wind gusts and penny size hail. Expect considerable tree damage. damage is likely to mobile homes, roofs and outbuildings. this severe storm will be near, longworth around 1100 pm cst. roby around 1105 pm cst. sylvester around 1110 pm cst. mccaulley around 1115 pm cst. other locations impacted by this severe thunderstorm include lake sweetwater, capitola, the intersection of highway 70 and ranch road 53, hitson, us-84 near the nolan-fisher county line, stith, i-20 near the nolan-mitchell county line, gannon, busby and camp boothe oaks. this includes interstate 20 between mile markers 229 and 278. a tornado watch remains in effect until 200 am cst for west central texas. A tornado watch also remains in effect until 300 am cst for west central texas. 11/16/2015 10:40 PM CST At 1039 pm cst, a severe thunderstorm was located near loraine, or 9 miles southwest of roscoe, moving northeast at 60 mph (radar indicated). Hazards include 70 mph wind gusts and penny size hail. Expect considerable tree damage. damage is likely to mobile homes, roofs and outbuildings. 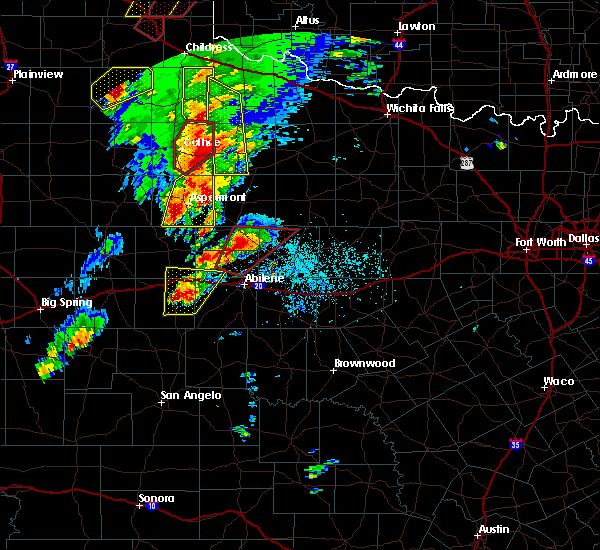 this severe thunderstorm will be near, wastella around 1045 pm cst. 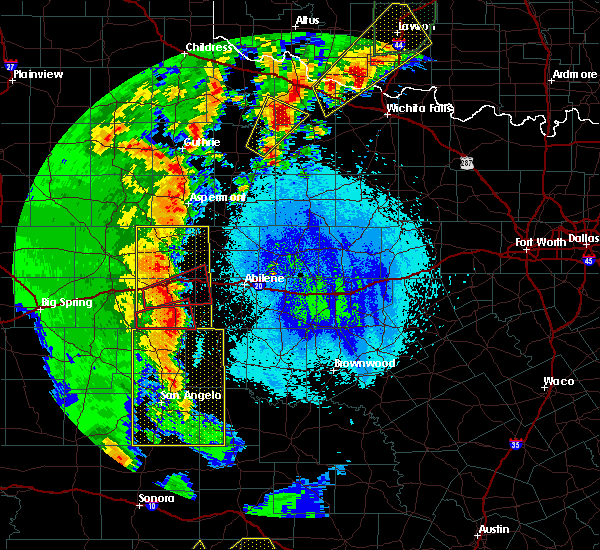 roscoe around 1050 pm cst. sweetwater around 1055 pm cst. longworth around 1105 pm cst. sylvester around 1110 pm cst. mccaulley around 1115 pm cst. other locations impacted by this severe thunderstorm include lake sweetwater, capitola, the intersection of highway 70 and ranch road 53, hitson, us-84 near the nolan-fisher county line, stith, i-20 near the nolan-mitchell county line, gannon, busby and camp boothe oaks. this includes interstate 20 between mile markers 229 and 278. 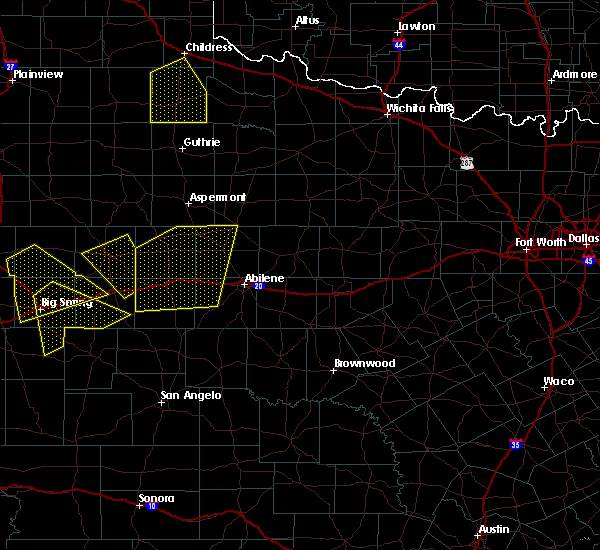 A tornado watch remains in effect until 200 am cst for west central texas. 5/30/2015 2:04 AM CDT At 159 am cdt, severe thunderstorms were located along a line extending from clyde to 7 miles northwest of rowena, and moving east at 35 mph (radar indicated). Hazards include 60 mph wind gusts. Expect damage to roofs. siding and trees. 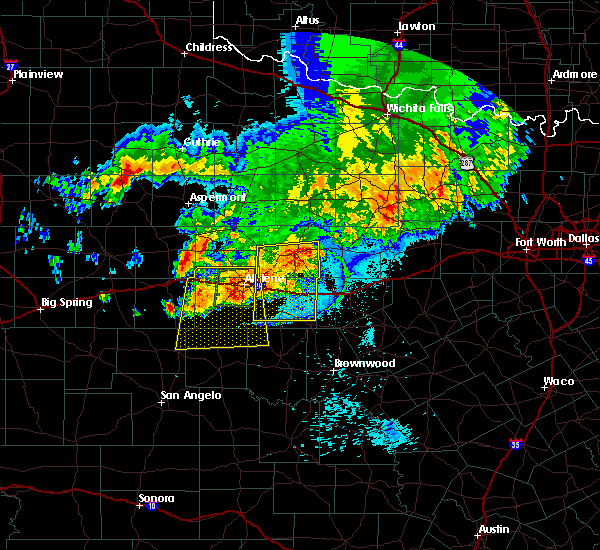 severe thunderstorms will be near, rowena and ballinger around 210 am cdt. crews and baird around 215 am cdt. oplin and benoit around 220 am cdt. novice around 225 am cdt. glen cove and rowden around 230 am cdt. other locations in the warning include goldsboro, lake coleman, us-283 near the coleman-callahan county line and hords creek reservoir. This includes interstate 20 between mile markers 259 and 307. 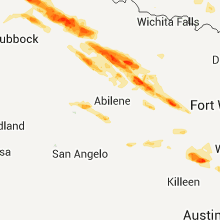 5/30/2015 1:42 AM CDT At 139 am cdt, severe thunderstorms were located along a line extending from abilene to tennyson, moving east at 35 mph (radar indicated). Hazards include 60 mph wind gusts. Expect damage to roofs. siding and trees. 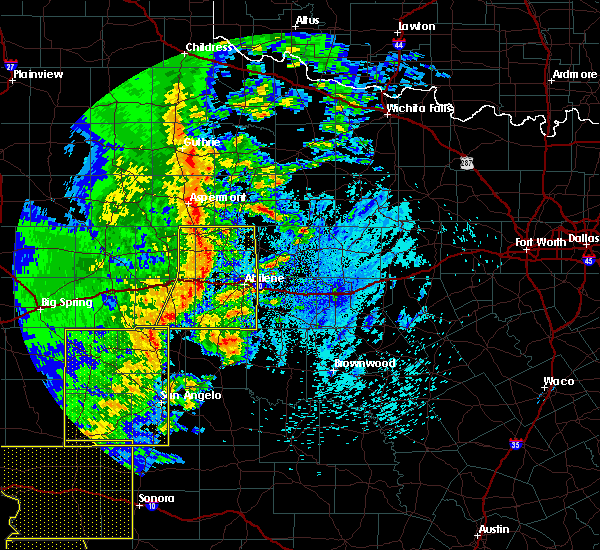 severe thunderstorms will be near, norton and bradshaw around 150 am cdt. winters and tuscola around 155 am cdt. lawn around 200 am cdt. 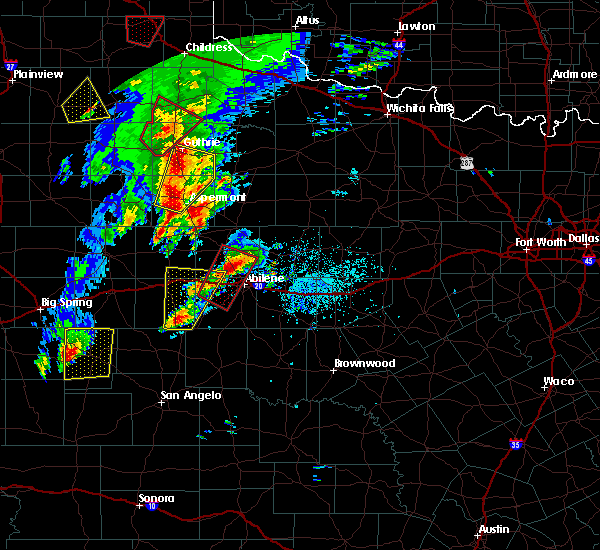 hatchel and eula around 205 am cdt. rowena and ballinger around 210 am cdt. crews and baird around 215 am cdt. other locations in the warning include ovalo, ballinger lake, lake winters lake, goldsboro, lake coleman, us-283 near the coleman-callahan county line and hords creek reservoir. This includes interstate 20 between mile markers 252 and 307. 5/30/2015 1:34 AM CDT At 132 am cdt, severe thunderstorms were located along a line extending from tye to tennyson to 11 miles southwest of broome, and moving southeast at 40 mph (radar indicated). Hazards include 60 mph wind gusts and nickel size hail. Expect damage to roofs. siding and trees. severe thunderstorms will be near, caps and maverick around 140 am cdt. 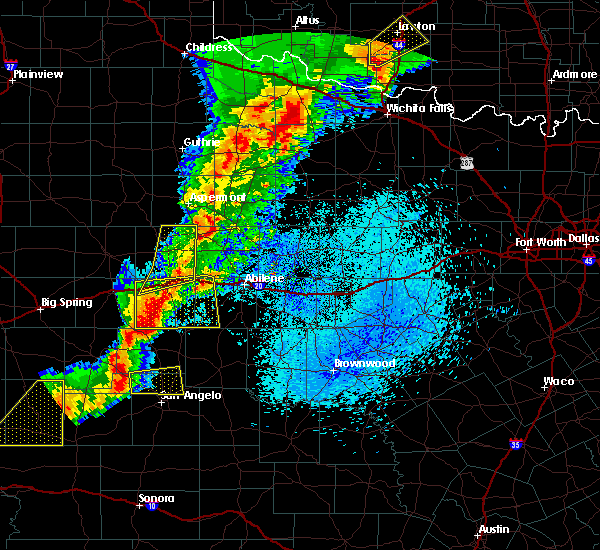 wylie and norton around 145 am cdt. tuscola and bradshaw around 150 am cdt. 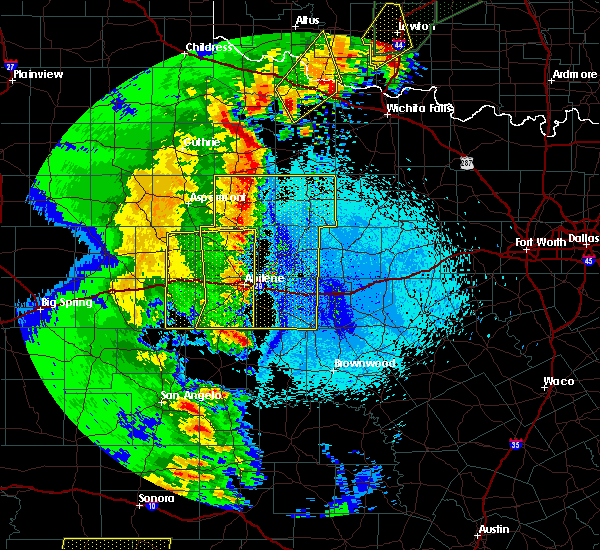 other locations in the warning include lake abilene, wilmeth, pumphrey, camp tonkawa, drasco and ovalo. This includes interstate 20 between mile markers 240 and 279. 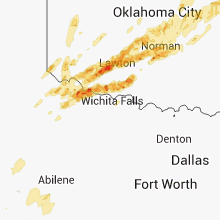 5/30/2015 1:15 AM CDT At 114 am cdt, severe thunderstorms were located along a line extending from nolan to robert lee to 10 miles southwest of sterling city, moving east-southeast at 40 mph (radar indicated). Hazards include 60 mph wind gusts and quarter size hail. Hail damage to vehicles is expected. expect wind damage to roofs, siding and trees. severe thunderstorms will be near, fort chadbourne and hylton around 120 am cdt. coronados camp and water valley around 125 am cdt. wingate and tennyson around 130 am cdt. norton and maverick around 135 am cdt. 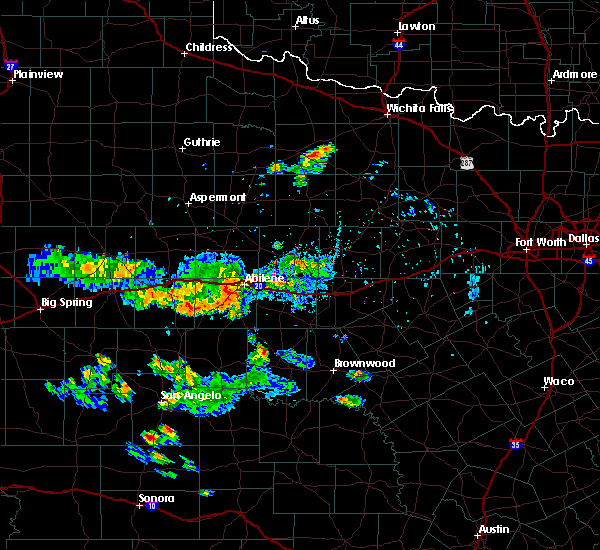 bradshaw and winters around 140 am cdt. other locations in the warning include shep, the intersection of highway 208 and ranch road 2662, us-87 near the coke-tom green county line, wilmeth, pumphrey and drasco. This includes interstate 20 between mile markers 240 and 280. 5/25/2015 10:51 AM CDT At 1048 am cdt, severe thunderstorms were located along a line extending from 6 miles north of stamford to lawn, and moving east at 40 mph (radar indicated). Hazards include 70 mph wind gusts. Expect considerable tree damage. damage is likely to mobile homes, roofs and outbuildings. severe thunderstorms will be near, paint creek and potosi around 1100 am cdt. dudley and lake stamford marina around 1105 am cdt. oplin and eula around 1110 am cdt. clyde around 1115 am cdt. irby around 1120 am cdt. baird around 1125 am cdt. 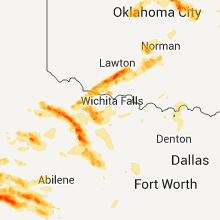 other locations in the warning include lake fort phantom hill, the intersection of us-180 and farm road 600, big country baptist assembly, us-283 near the callahan-shackelford county line, mccarty lake and the intersection of us-380 and highway 222. This includes interstate 20 between mile markers 259 and 303. 5/25/2015 10:38 AM CDT At 1033 am cdt, severe thunderstorms were located along a line extending from 6 miles west of stamford to maverick, moving northeast at 40 mph (radar indicated). Hazards include 60 mph wind gusts. Expect damage to roofs. siding and trees. severe thunderstorms will be near, coronados camp and stamford around 1045 am cdt. 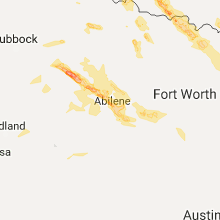 abilene around 1050 am cdt. tye around 1050 am cdt. paint creek and caps around 1055 am cdt. lake stamford marina and buffalo gap around 1100 am cdt. 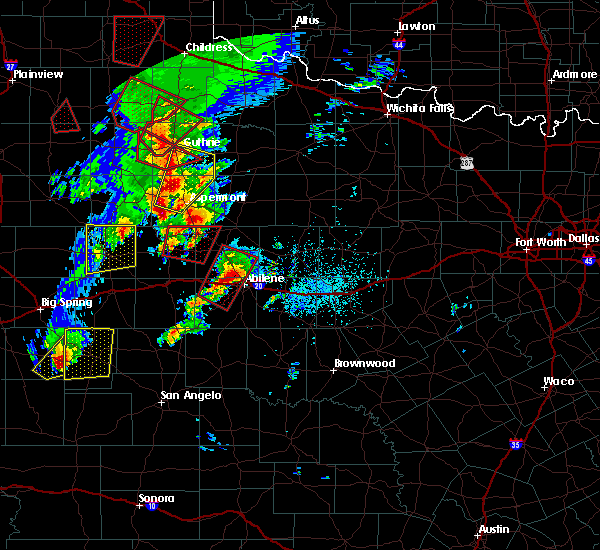 wylie and tuscola around 1105 am cdt. lawn around 1110 am cdt. other locations in the warning include hodges, funston, camp tonkawa, lake abilene, the intersection of us-180 and farm road 600, impact, lake fort phantom hill, kirby lake, ovalo and big country baptist assembly. This includes interstate 20 between mile markers 259 and 304. 5/25/2015 10:22 AM CDT At 1019 am cdt, severe thunderstorms were located along a line extending from hamlin to hylton, and moving southeast at 40 mph (radar indicated). Hazards include 60 mph wind gusts. Expect damage to roofs. siding and trees. 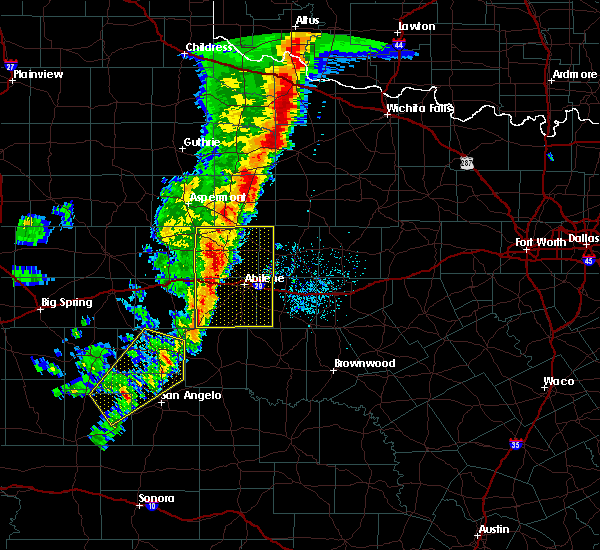 severe thunderstorms will be near, noodle and happy valley around 1030 am cdt. merkel around 1035 am cdt. anson and coronados camp around 1040 am cdt. other locations in the warning include shep, truby, stith and hodges. This includes interstate 20 between mile markers 243 and 270. 5/25/2015 9:58 AM CDT At 955 am cdt, severe thunderstorms were located along a line extending from longworth to silver, moving east at 40 mph (radar indicated). Hazards include 60 mph wind gusts. Expect damage to roofs. siding and trees. severe thunderstorms will be near, trent and nolan around 1015 am cdt. merkel and hylton around 1025 am cdt. happy valley around 1030 am cdt. coronados camp around 1035 am cdt. other locations in the warning include lake sweetwater, the intersection of highway 70 and ranch road 53, camp butman and shep. This includes interstate 20 between mile markers 228 and 270. 5/16/2015 6:59 PM CDT At 656 pm cdt, a severe thunderstorm was located near hawley, and moving east at 30 mph (radar indicated). Hazards include hen egg size hail and 60 mph wind gusts. People and pets outdoors will be injured. expect hail damage to roofs, siding, windows and vehicles. expect wind damage to roofs, siding and trees. the severe thunderstorm will be near, nugent around 715 pm cdt. other locations in the warning include lake fort phantom hill. this includes interstate 20 between mile markers 265 and 302. 2. 00in. 5/16/2015 6:48 PM CDT At 645 pm cdt, a severe thunderstorm was located near hawley, and moving east at 35 mph (radar indicated). Hazards include ping pong ball size hail and 60 mph wind gusts. People and pets outdoors will be injured. expect hail damage to roofs, siding, windows and vehicles. expect wind damage to roofs, siding and trees. the severe thunderstorm will be near, nugent around 705 pm cdt. other locations in the warning include lake fort phantom hill. this includes interstate 20 between mile markers 265 and 302. 1. 50in. 5/16/2015 6:36 PM CDT At 634 pm cdt, a severe thunderstorm was located 6 miles east of noodle, moving east at 40 mph (radar indicated). Hazards include ping pong ball size hail and 60 mph wind gusts. People and pets outdoors will be injured. expect hail damage to roofs, siding, windows and vehicles. expect wind damage to roofs, siding and trees. the severe thunderstorm will be near, hawley around 650 pm cdt. nugent around 705 pm cdt. other locations in the warning include hodges and lake fort phantom hill. this includes interstate 20 between mile markers 261 and 302. 1. 50in. 5/16/2015 6:31 PM CDT At 628 pm cdt, a severe thunderstorm was located near noodle, and moving northeast at 40 mph (radar indicated). Hazards include ping pong ball size hail and 60 mph wind gusts. People and pets outdoors will be injured. expect hail damage to roofs, siding, windows and vehicles. expect wind damage to roofs, siding and trees. the severe thunderstorm will affect mainly rural areas of northeastern nolan, northwestern taylor, southeastern fisher and southwestern jones counties. this includes interstate 20 between mile markers 250 and 270. 1. 50in. 5/16/2015 6:15 PM CDT At 614 pm cdt, a severe thunderstorm was located near trent, and moving east at 35 mph (radar indicated). Hazards include 60 mph wind gusts and quarter size hail. Hail damage to vehicles is expected. expect wind damage to roofs, siding and trees. 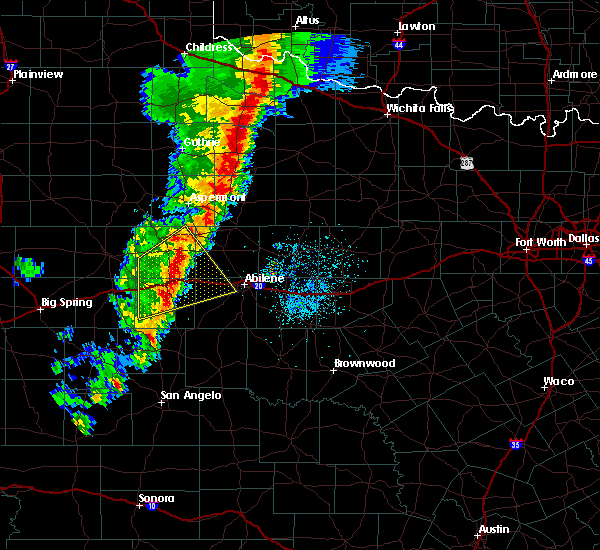 the severe thunderstorm will be near, merkel and noodle around 625 pm cdt. other locations in the warning include stith. this includes interstate 20 between mile markers 247 and 270. 1. 00in. 5/16/2015 5:58 PM CDT At 556 pm cdt, a severe thunderstorm was located near sweetwater, moving northeast at 35 mph (radar indicated). Hazards include 60 mph wind gusts and half dollar size hail. Hail damage to vehicles is expected. expect wind damage to roofs, siding and trees. the severe thunderstorm will be near, trent around 615 pm cdt. merkel around 625 pm cdt. noodle around 630 pm cdt. other locations in the warning include stith. this includes interstate 20 between mile markers 238 and 269. 1. 25in. 4/26/2015 6:34 PM CDT At 632 pm cdt, a severe thunderstorm was located near tye, moving east at 25 mph (radar indicated). Hazards include 60 mph wind gusts and quarter size hail. Hail damage to vehicles is expected. expect wind damage to roofs, siding and trees. the severe thunderstorm will be near, hawley around 645 pm cdt. 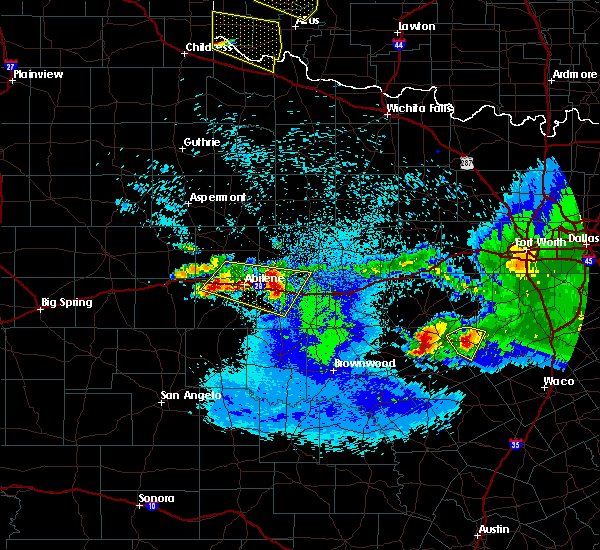 abilene around 650 pm cdt. hamby around 705 pm cdt. other locations in the warning include impact and lake fort phantom hill. this includes interstate 20 between mile markers 258 and 285. 1. 00in. 4/26/2015 6:22 PM CDT At 621 pm cdt, a severe thunderstorm was located near merkel, and moving northeast at 25 mph (radar indicated). Hazards include 60 mph wind gusts and quarter size hail. Hail damage to vehicles is expected. expect wind damage to roofs, siding and trees. locations impacted include, tye. this includes interstate 20 between mile markers 242 and 274. 1. 00in. 4/26/2015 5:57 PM CDT At 554 pm cdt, a severe thunderstorm was located near merkel, and moving northeast at 40 mph (radar indicated). Hazards include golf ball size hail and 60 mph wind gusts. People and pets outdoors will be injured. expect hail damage to roofs, siding, windows and vehicles. expect wind damage to roofs, siding and trees. the severe thunderstorm will affect mainly rural areas of nolan and northwestern taylor counties. this includes interstate 20 between mile markers 241 and 274. 1. 75in. 4/26/2015 5:49 PM CDT At 548 pm cdt, a severe thunderstorm was located 8 miles south of trent, moving northeast at 45 mph (radar indicated). Hazards include 60 mph wind gusts and half dollar size hail. Hail damage to vehicles is expected. expect wind damage to roofs, siding and trees. 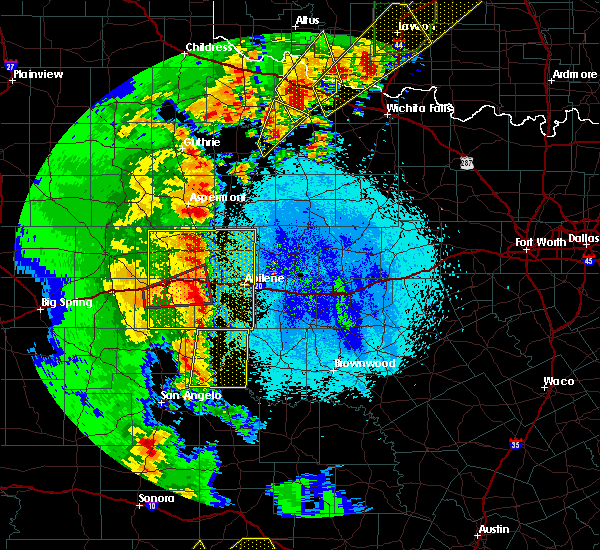 the severe thunderstorm will be near, trent around 600 pm cdt. merkel around 605 pm cdt. this includes interstate 20 between mile markers 241 and 274. 1. 25in. 4/17/2015 1:27 PM CDT At 126 pm cdt, a severe thunderstorm was located near wylie, and moving northeast at 20 mph (radar indicated). Hazards include 60 mph wind gusts and quarter size hail. Hail damage to vehicles is expected. expect wind damage to roofs, siding and trees. 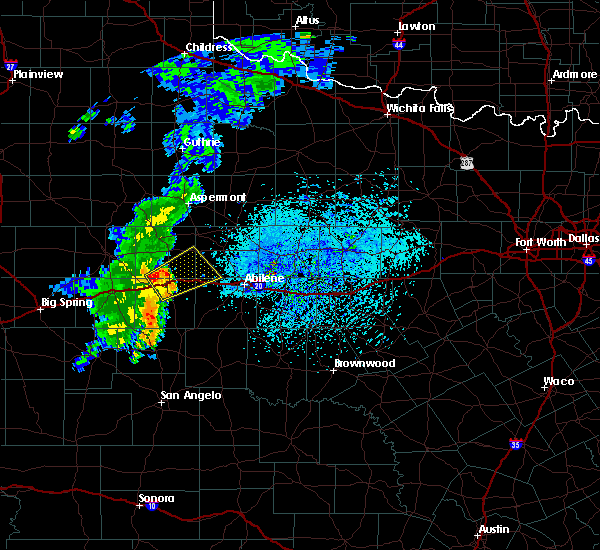 the severe thunderstorm will be near, hamby around 145 pm cdt. other locations in the warning include impact. this includes interstate 20 between mile markers 264 and 285. 1. 00in. 4/17/2015 1:07 PM CDT At 104 pm cdt, a severe thunderstorm was located near buffalo gap, and moving northeast at 20 mph (radar indicated). Hazards include golf ball size hail and 60 mph wind gusts. People and pets outdoors will be injured. expect hail damage to roofs, siding, windows and vehicles. expect wind damage to roofs, siding and trees. 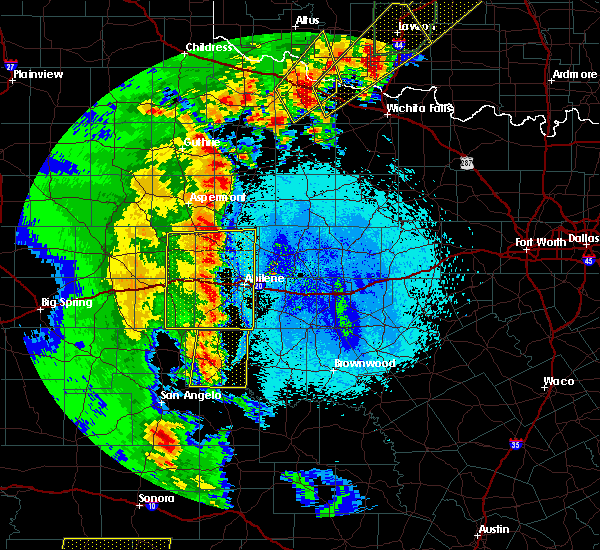 the severe thunderstorm will be near, wylie around 115 pm cdt. potosi around 125 pm cdt. 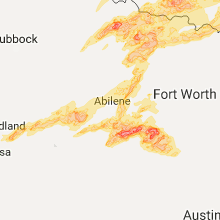 abilene around 130 pm cdt. hamby around 145 pm cdt. other locations in the warning include kirby lake. this includes interstate 20 between mile markers 264 and 285. 1. 75in. 4/17/2015 1:04 PM CDT At 102 pm cdt, a severe thunderstorm was located near buffalo gap, moving northeast at 20 mph (radar indicated). Hazards include 60 mph wind gusts and quarter size hail. Hail damage to vehicles is expected. expect wind damage to roofs, siding and trees. the severe thunderstorm will be near, caps around 110 pm cdt. wylie and dyess afb around 115 pm cdt. potosi around 125 pm cdt. abilene around 135 pm cdt. hamby around 145 pm cdt. other locations in the warning include kirby lake and impact. this includes interstate 20 between mile markers 264 and 285. 1. 00in. 4/16/2015 7:22 PM CDT At 719 pm cdt, a severe thunderstorm was located near dyess afb, and moving northeast at 20 mph. this storm has the potential to produce large hail and damaging winds (radar indicated). Hazards include 60 mph wind gusts and quarter size hail. Hail damage to vehicles is expected. expect wind damage to roofs, siding and trees. the severe thunderstorm will be near, tye around 730 pm cdt. hawley around 800 pm cdt. other locations in the warning include hodges. this includes interstate 20 between mile markers 261 and 276. 1. 00in. 4/16/2015 7:11 PM CDT At 710 pm cdt, a severe thunderstorm was located near view, moving northeast at 20 mph. interstate 20 is in the path of this storm (radar indicated). Hazards include 60 mph wind gusts and quarter size hail. Hail damage to vehicles is expected. expect wind damage to roofs, siding and trees. the severe thunderstorm will be near, dyess afb around 725 pm cdt. tye around 730 pm cdt. hawley around 800 pm cdt. other locations in the warning include hodges. this includes interstate 20 between mile markers 260 and 277. 1. 00in.